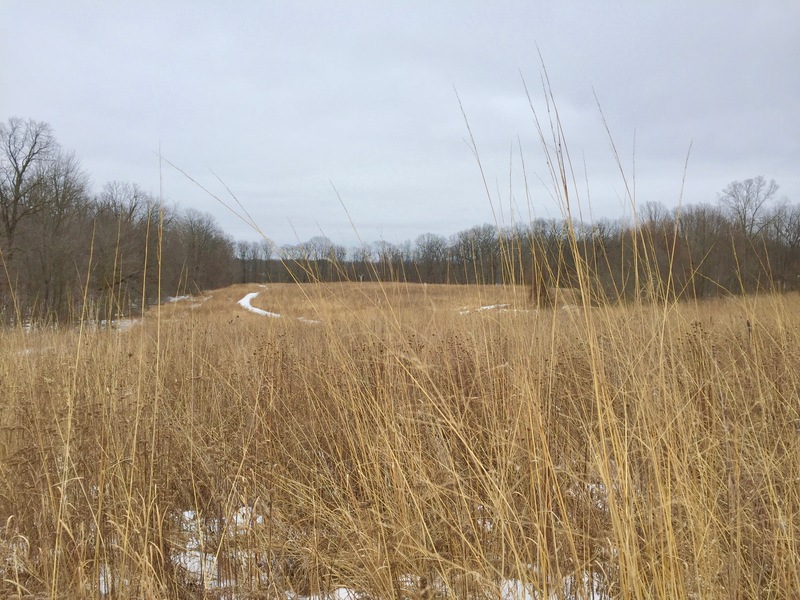 Charles Ilsley Park’s Northern Prairie, as seen from the spring-fed pond in the center of the park. 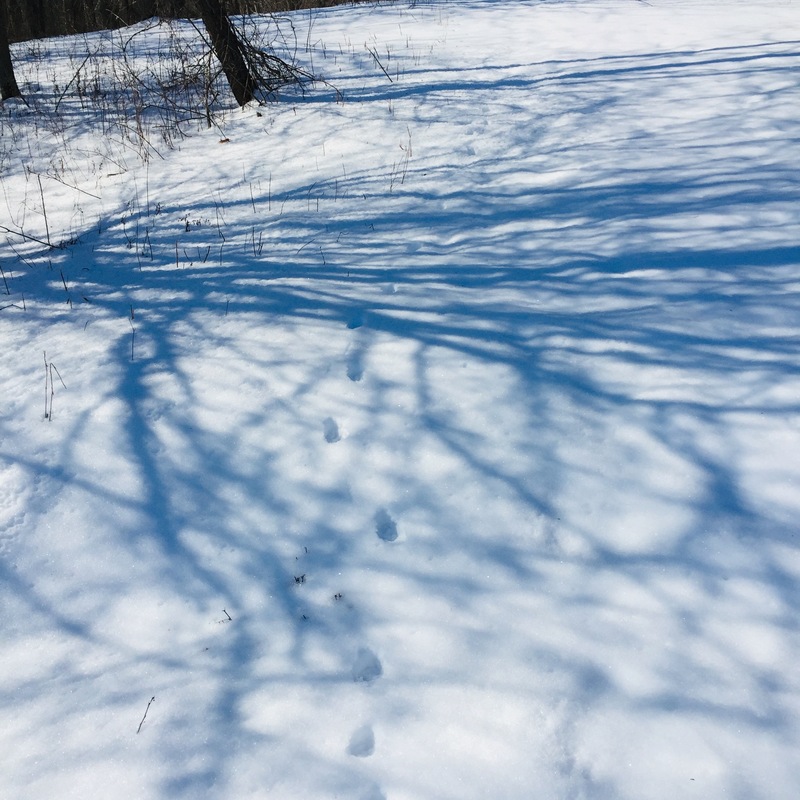 One February morning, I pursued the paw prints of an unseen coyote who had left a trail in the ice-encrusted snow on the previous moonlit night. 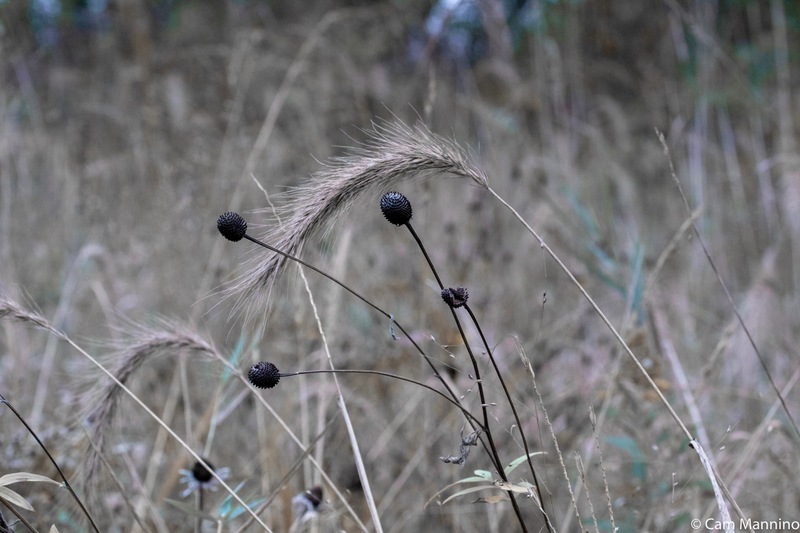 And I spent part of an afternoon just noticing the brown and gray architecture of the dry seed heads of some favorite summer wildflowers, now ghosts of their colorful summer selves. Their pleasing shapes provided some inspiration about the native garden I’m dreaming about for next summer. 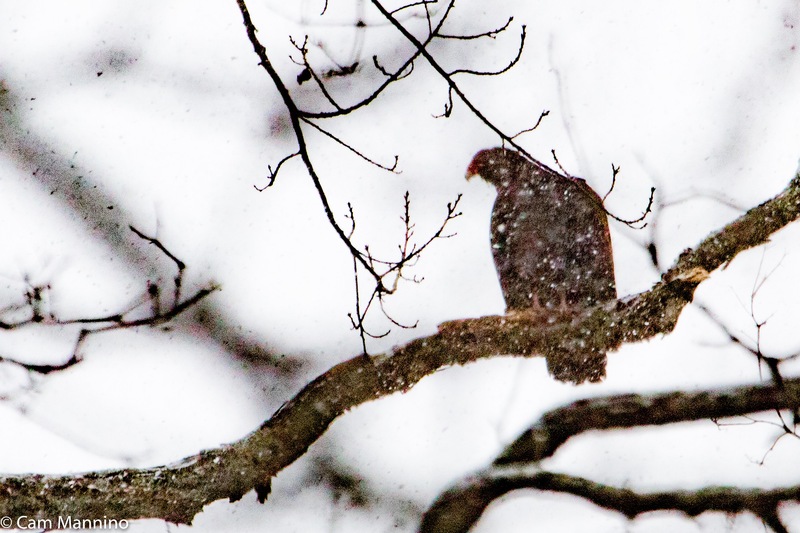 But I’ll start this blog with the handful of birds that I did see, that kept me company on frigid days, just to remind myself that I had sturdy companions on the grayest and coldest days of the year. Who’s That Twittering in the Tall Grass? 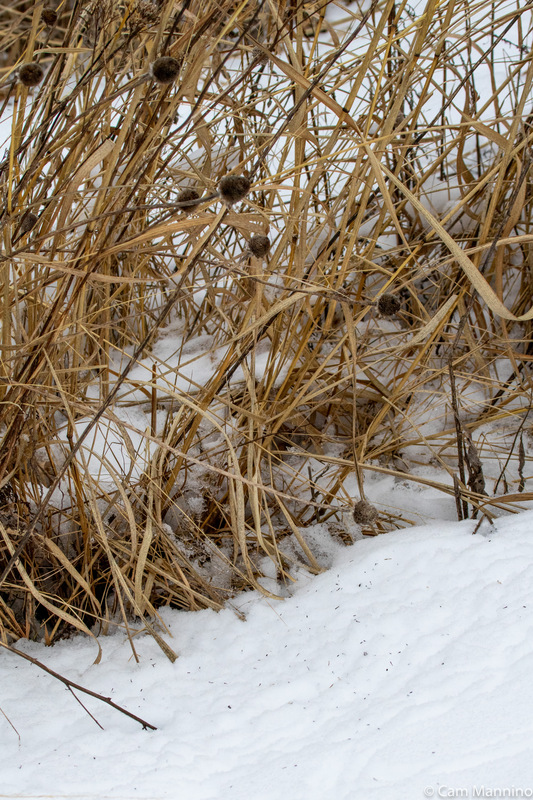 Stalks of Indian Grass forming a scrim as I look across the Eastern Prairie at Charles Ilsley Park. 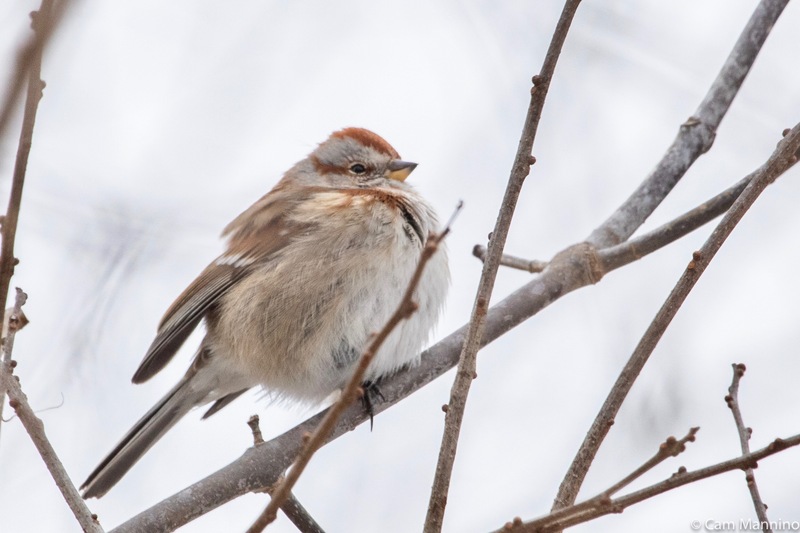 One late afternoon as I approached the Eastern Prairie at Ilsley, I heard the cheerful “chatting” (see first “call” heading at this link) of a small group of winter visitors from the Arctic, American Tree Sparrows (Spizelloides arborea). One of them paused long enough for a good look at its two-tone bill. 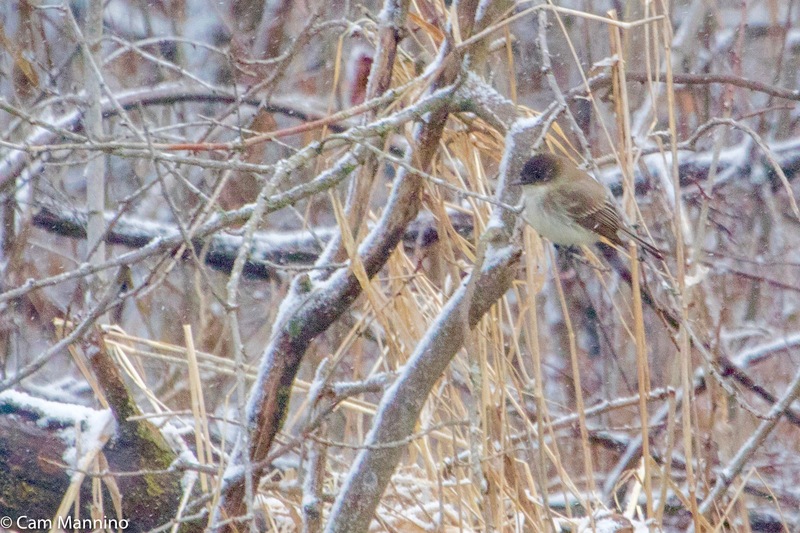 This little bird had puffed up its down jacket to deal with a frigid morning! 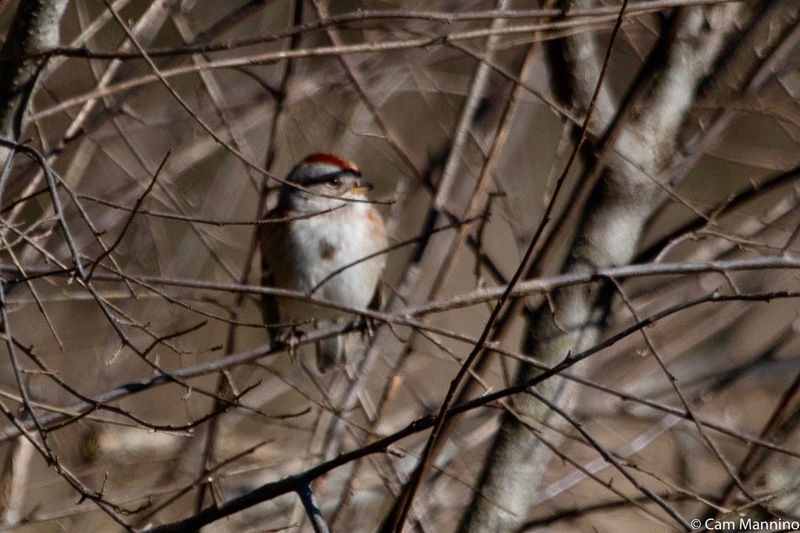 The two-toned bill, breast spot, eye-line and chestnut cap are the Tree Sparrow’s field marks. 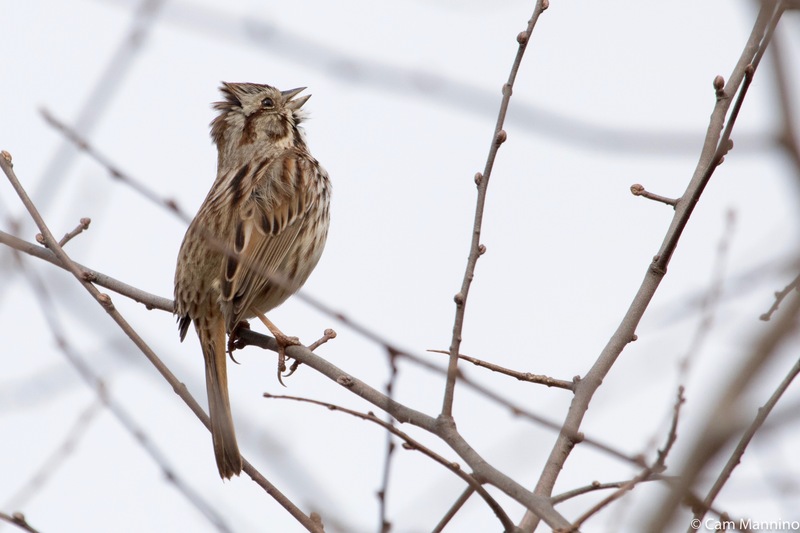 Two days later, the birding group heard more “chatting.” We spotted a large flock of Tree Sparrows flowing like a river from the trees, down into the tall prairie grass. These social flocks keep in contact with short calls back and forth – “I’m here! I’m over here!” – as they forage. 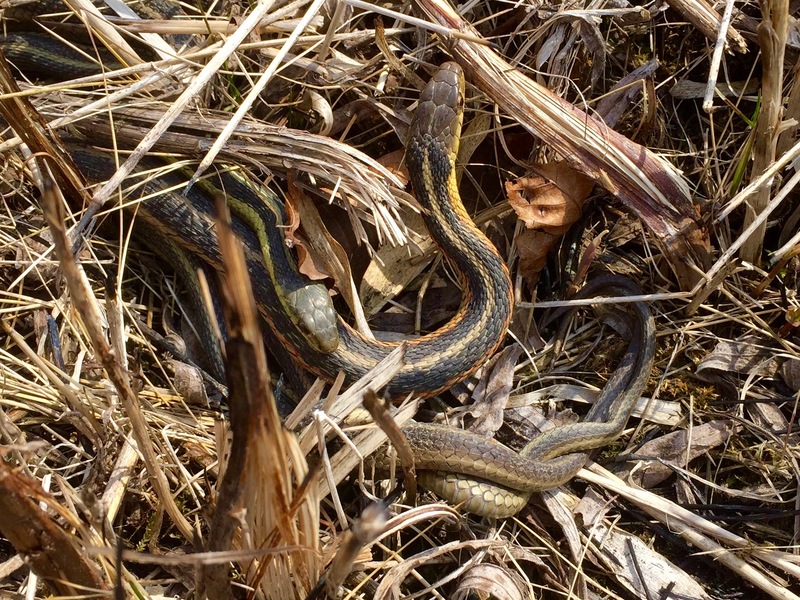 I managed to catch a group of them in a vine-laden bush at the edge of prairie. 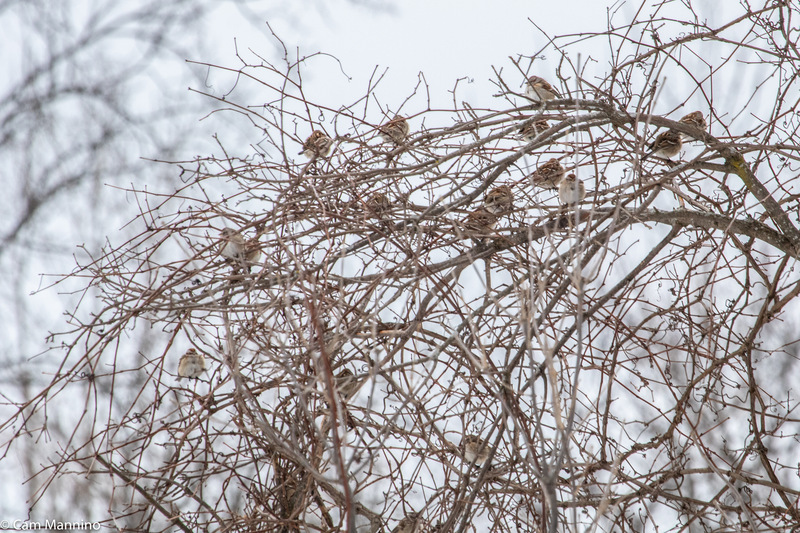 Part of a large flock, of Tree Sparrows feeding in the Eastern Prairie at Charles Ilsley Park. 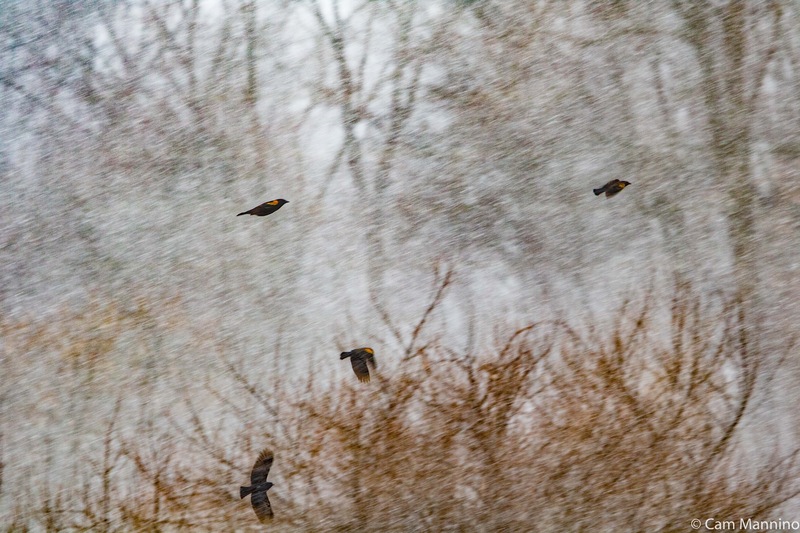 It was wonderful to watch so many migratory birds feeding enthusiastically on the native seeds of our restored prairie. We were curious to see which plants they were enjoying. That morning they were finding bent Black-eyed Susan stems (Rudbeckia hirta) and plucking out the seeds. Here’s the bent stem at almost ground level, the seeds on the snow and the area trampled by the flock’s small feet. The bent stalk of a Black-eyed Susan near the ground makes it easier for the Tree sparrows to get at the seed. 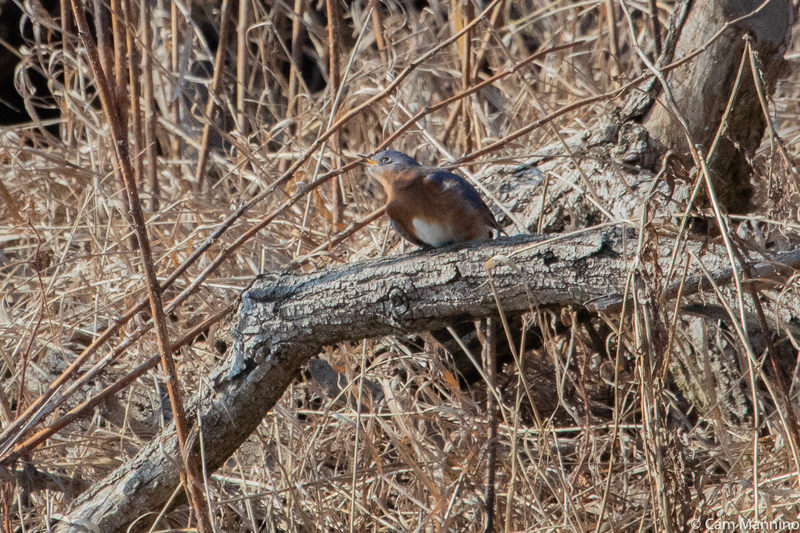 On a Sunday walk in the Western Prairie at Charles Ilsley Park, my husband and I spotted Eastern Bluebirds (Sialia sialis) diving in and out of the grass. 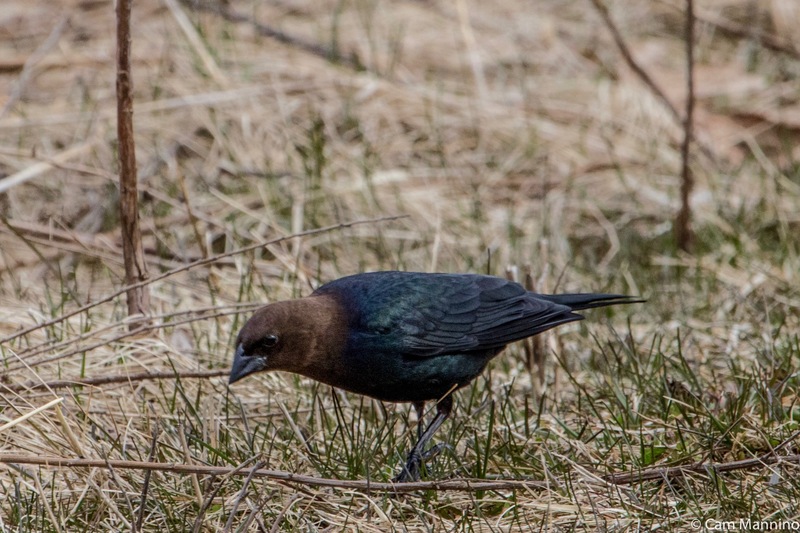 Finally, a pair of them settled on some brush and fallen logs along the tree line. The male ignored me completely while he preened vigorously. Since bluebirds often use the abandoned nests of woodpeckers in the winter, I wondered if he’d picked up some mites from an old nest, poor fellow. I managed to get one quick shot when he rested for just a moment. 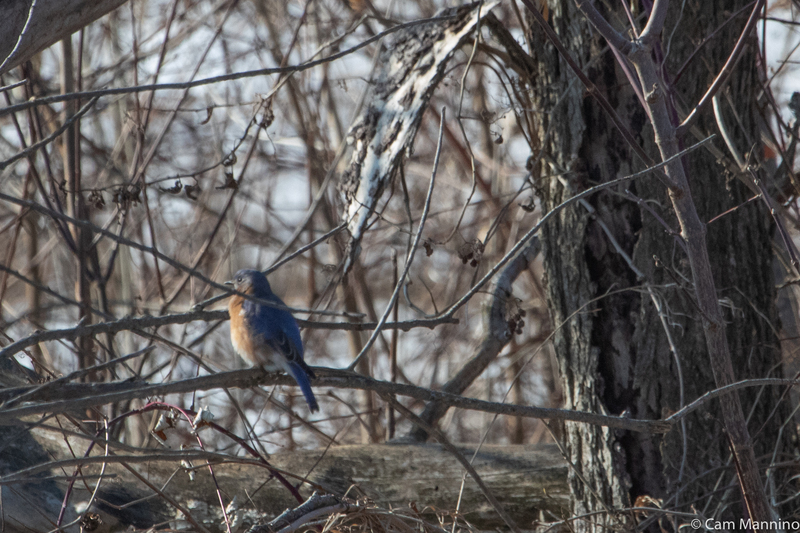 A male Eastern Bluebird paused from preening for just a few seconds while sitting in the brush near the tree line. 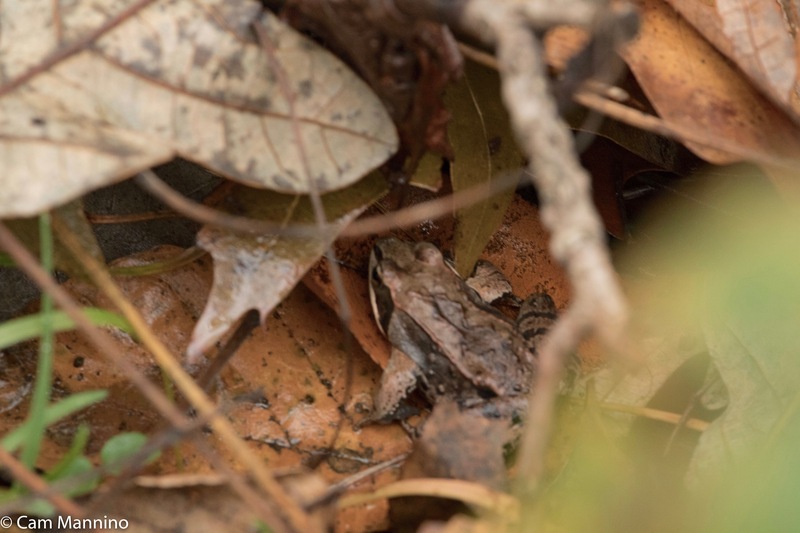 The female nearby was keeping an eye on me and as I approached she sent the male a little “chit-chit-chit” call (second “call” heading at this link) that warns of ground predators – me, in this case! Then they both flew off again. The female bluebird gave a little signal call to her preening mate as I approached. At the far edge of the western prairie, we heard the “ank-ank-ank” call of the White Breasted Nuthatch (Sitta carolinensis). (Under “Eastern calls” at this link.) It was hopping quickly from branch to dead branch above our heads, searching out anything it could eat , like frozen insect eggs or caterpillars. 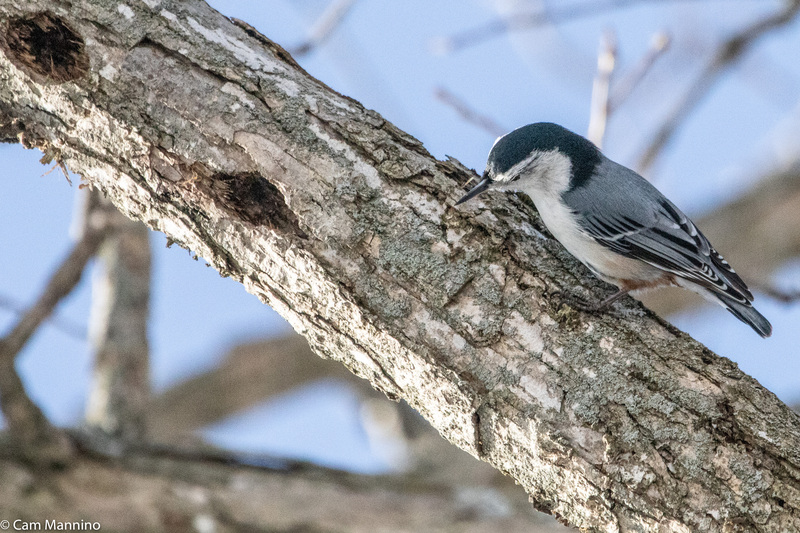 A White-breasted Nuthatch probed the bark on a dead limb for hidden insects or their eggs. Some pretty striking tracks greeted me in the center field of the park. As I started out one Thursday morning, I was presented with some pretty impressive tracks. I recognized them immediately, because one of them was mine! The last four birders on the Wednesday morning bird walk had trekked along chatting as we went back to our cars. As a former bookseller, I had to smile remembering Pooh and Piglet tracking a “heffalump” around a bush, which of course turned out to be their own footprints, too. A fun beginning to my search for animal tracks. 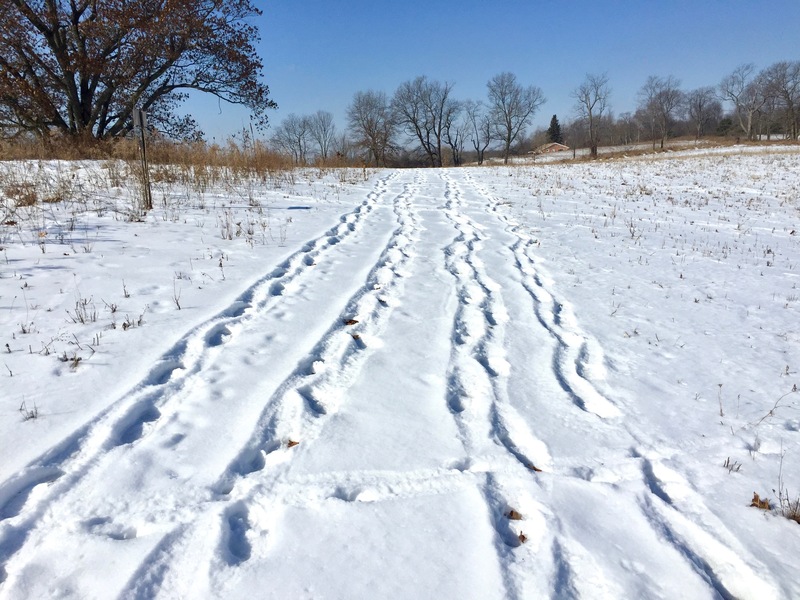 I left the trail and headed diagonally across the field following a nice straight line of canine prints – and readers of my previous winter blogs probably know what that means – a Coyote! 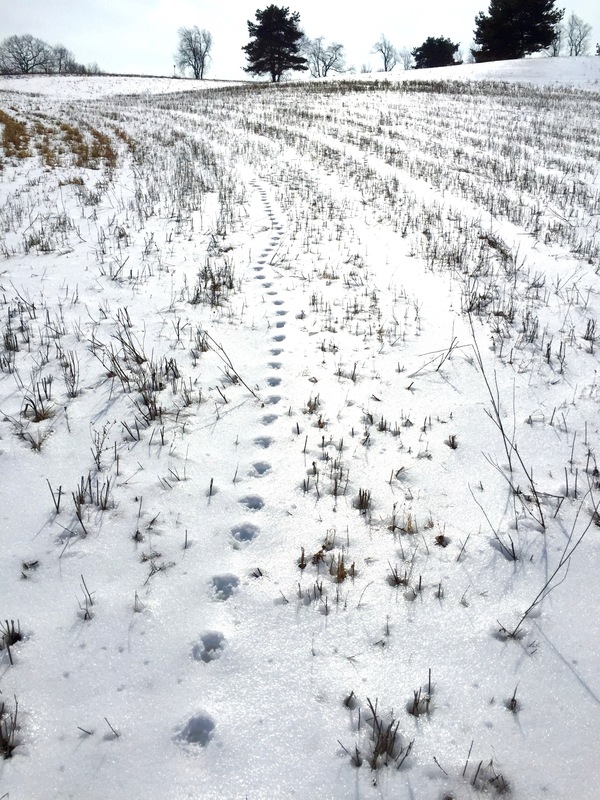 Coyotes (Canis latrans) trot along at night making a straight trail of prints. Being wild animals, coyotes want to use as little energy as necessary between meals, so they never run around in the snow like dogs do. They place their back feet inside the print of their front feet to use less energy and move directly where they want to go. 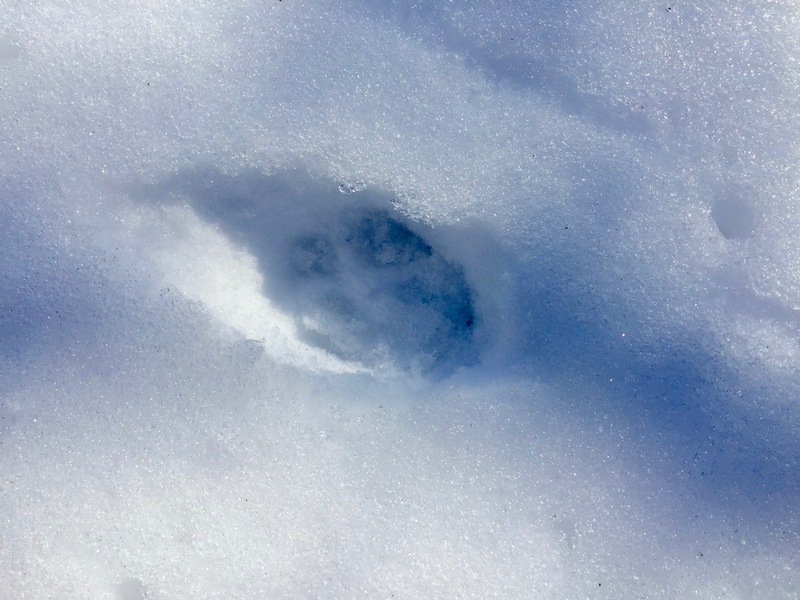 Because a crust covered the snow after freezing rain, it was clear that this coyote had to break through the snow with each step, leaving a pointed top to the track it left behind. A coyote print in iced-over snow. 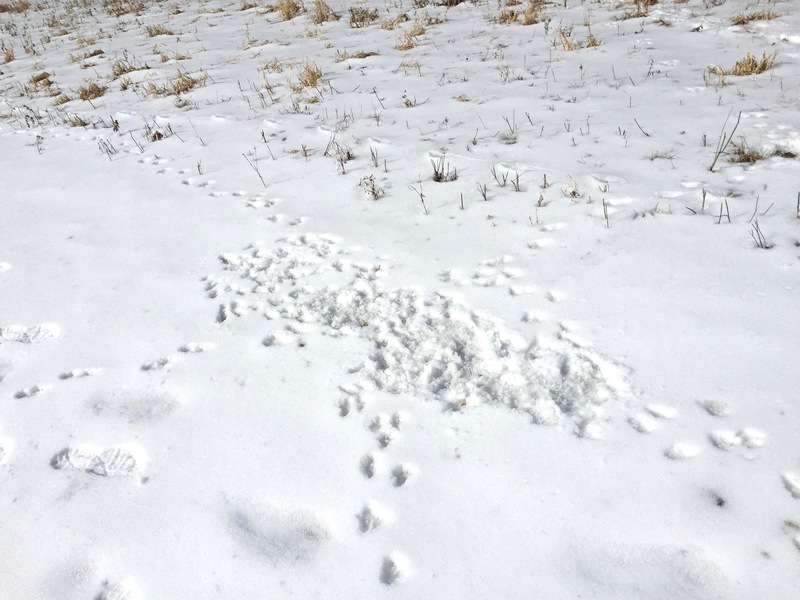 I followed the prints as it became apparent that this coyote was headed for the farthest west section of the park, where Stewardship Manager Ben VanderWeide had hired a forestry mower to remove invasive shrubs and create a path to the nearby subdivision for residents’ use. Two trees nicely frame the opening to this newly renovated area. The entrance to the farthest west section of Charles Ilsley Park with its rolling land and woods. 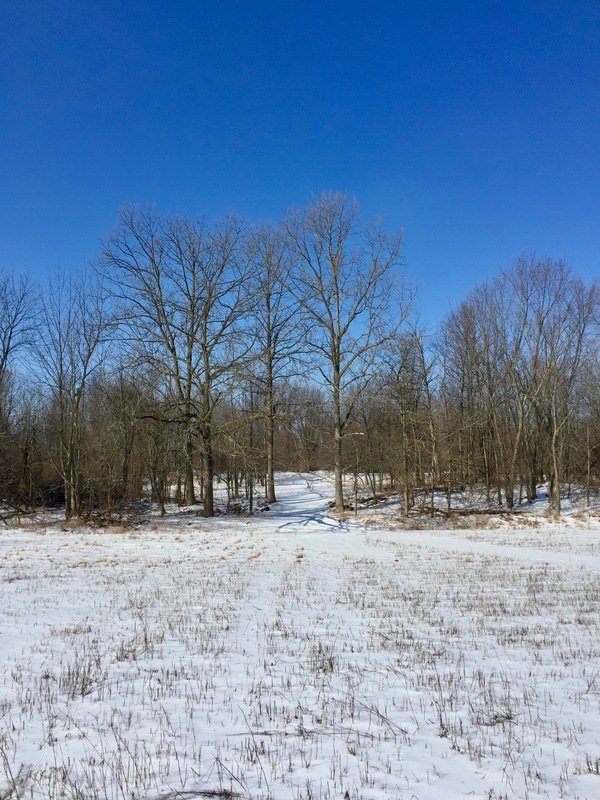 This western section with its rolling, glacial landscape, wetlands and wooded areas is very different from the open prairies of Ilsley. It seems our coyote thought this might be a better place to rest on an icy, windy night. Coyotes are not really nocturnal animals, but they have learned that night is a good time to hunt and not be bothered by humans and their activities. So I imagine this coyote had been out hunting mice on the prairie and was heading back to the woods to get out of the wind. The coyotes prints entering the western section of the park. 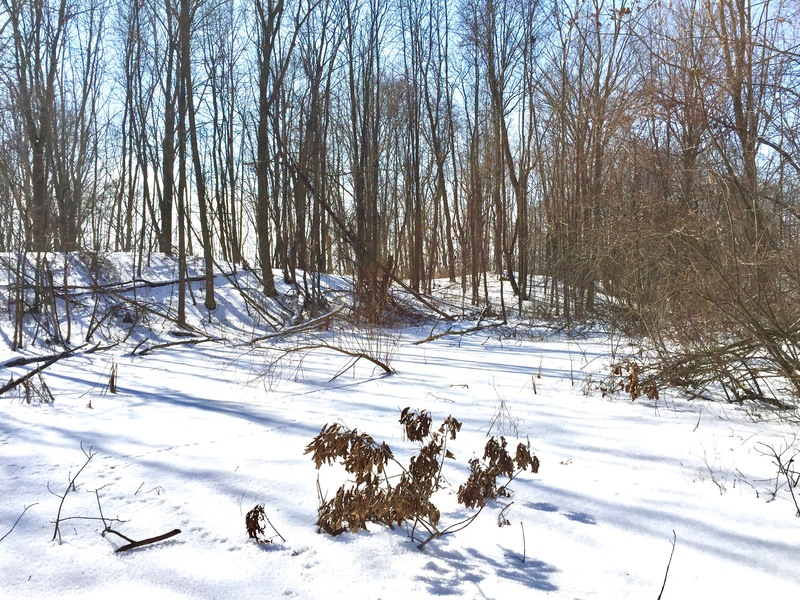 After passing into the western area, the coyote turned sharply south into the woods. So I followed its tracks, imagining it trotting between the trees, slipping in and out of the shadows made by the full moon the night before. 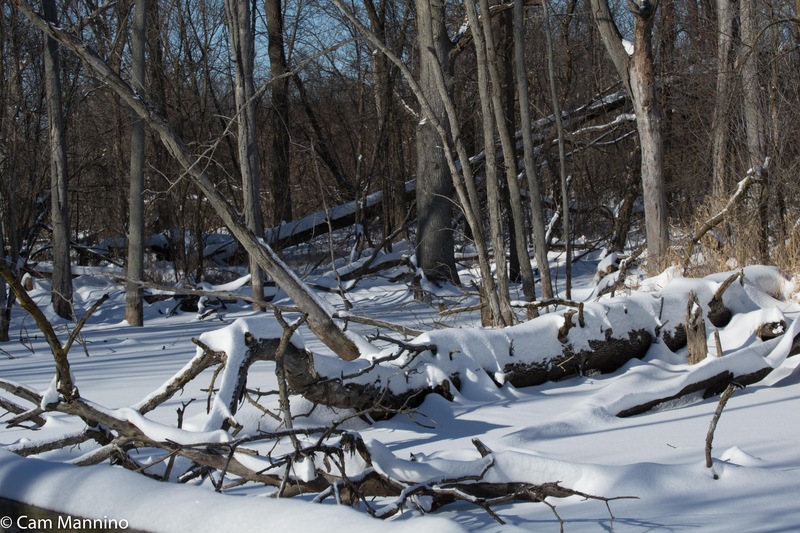 The coyote heads off into the woods in the western part of Charles Ilsley Park. It’s easy to see that among the glacially-formed slopes of this rolling landscape, a coyote would be out of the sharp wind that blew across the prairie. 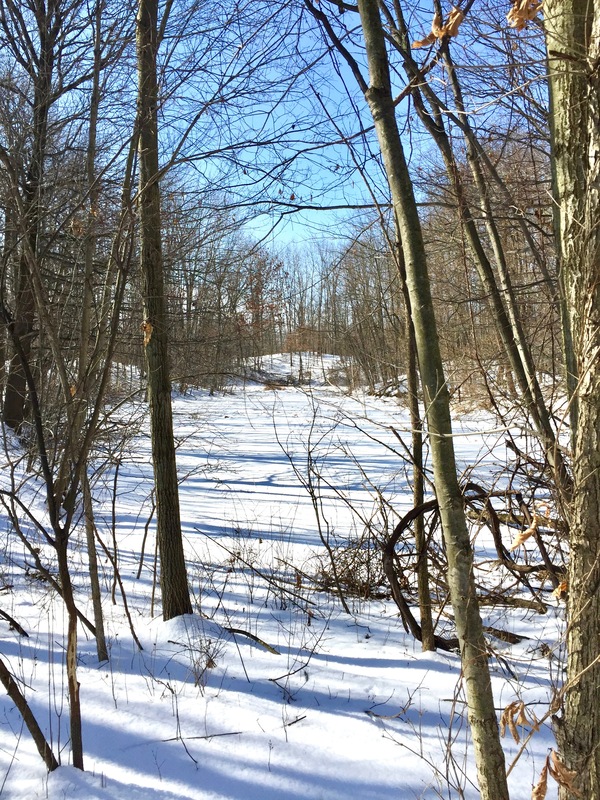 The landscape in this area of the park is suddenly so different, as the slopes rise and then descend to one wetland after another. 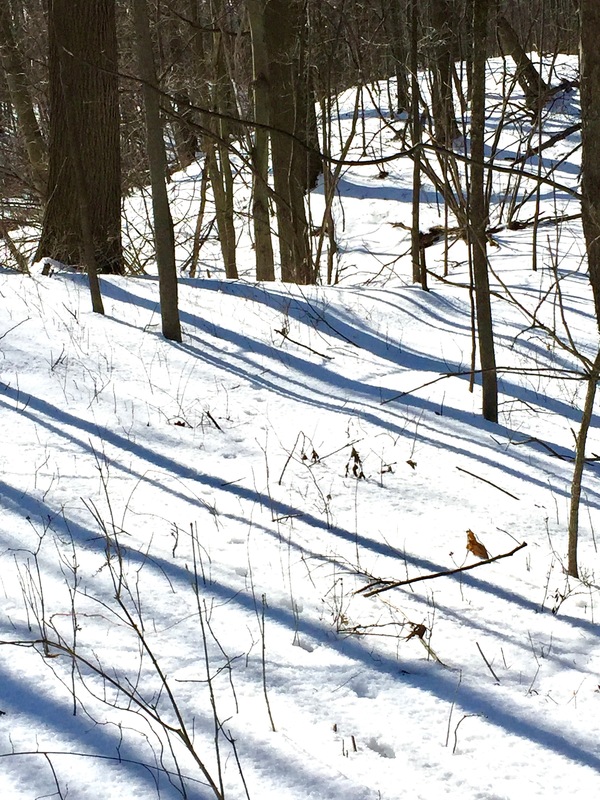 I kept following the coyote deeper into the woods as the line of prints flowed over the slopes. The coyote’s tracks flowed over the slopes. At last the coyote’s tracks came down to a small pond where they seemed to end in a flattened area under some vines and branches at the right which would have provided a bit of cover. A flat area under the bushes and vines on the right looked like it could be a place where the coyote spent the night out of the wind. Beyond that pond was another lovely little pond covered in snow and embraced by the hills around it – but not a track in sight. I lost the coyote’s trail after that and wandered up to Ben’s path again. 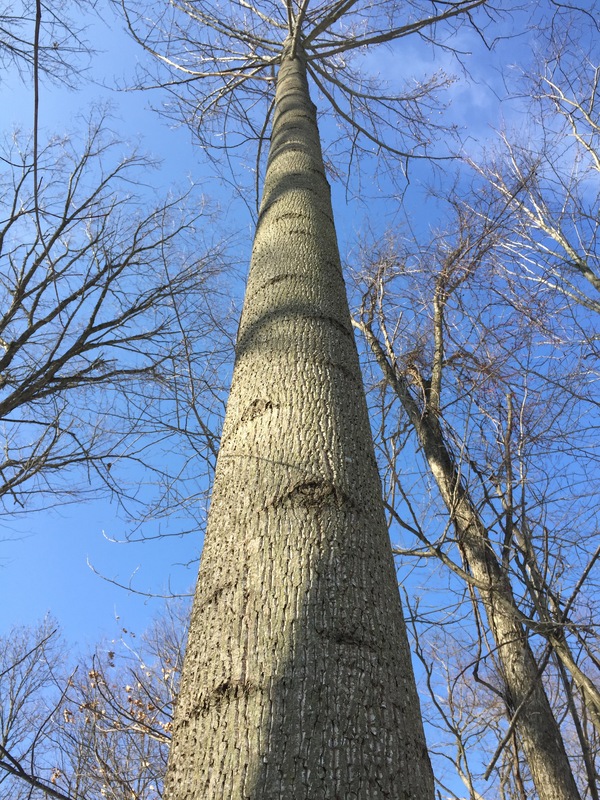 I stopped to admire a very tall, wonderfully straight native Tulip Tree (Liriodendron tulipfera) with its closely furrowed bark. Its yellow blossoms were now dried but still quivering in the wind at the very top of the tree. Ben pointed it out on an earlier walk and told us he thought our area is at the northern edge of this lovely tree’s range. It’s the first wild tulip tree I’ve ever seen. The dried blossoms of a Tulip-tree which always blooms on the highest branches. Nearby stood a tall Silver Maple (Acer saccharinum), its red buds just waiting to expand and bring us one of the first really vivid colors of early spring. 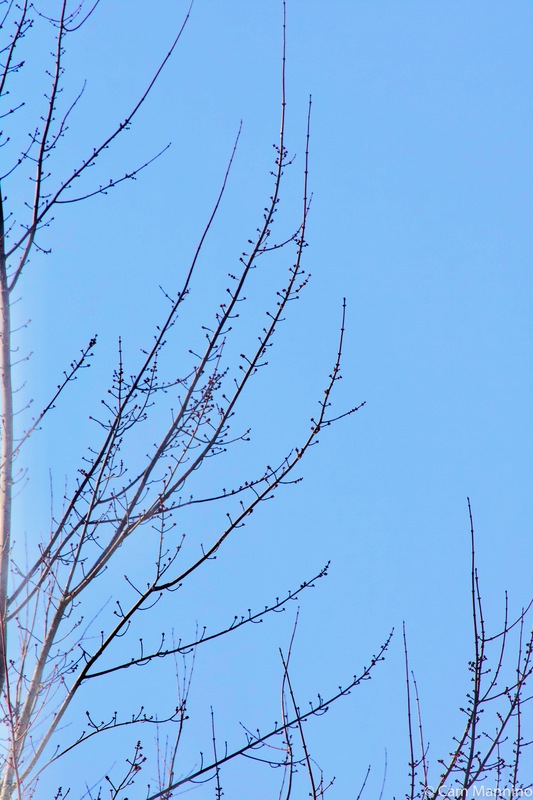 Red buds high on a Silver Maple will swell and offer up one of the first bright colors of spring. 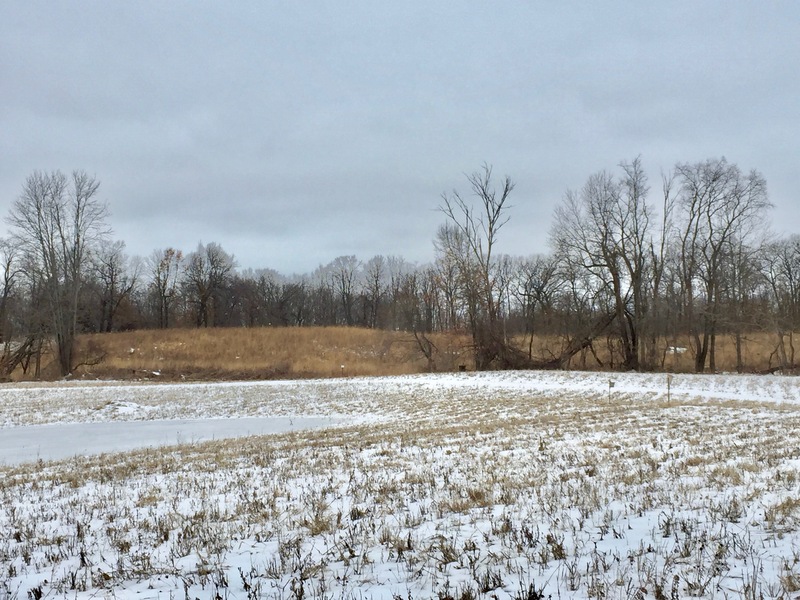 As I left the western wooded area and headed back onto the western prairie, I came across a flattened place in the trail that looked like a major crossroads for critters. The tracks around it were hard to read . I thought I recognized squirrel and possible rabbit tracks, but I have no idea who was there and what was going on, really. Since there are coyote tracks above this flattened area, I wondered if one slept here; as top predators, they do sleep in the open at times. Its warmth would have melted the snow and allowed smaller creatures to get to the ground underneath the crusted surface once the coyote left the scene. Just a guess. One possible hint was a hole in the snow nearby where a squirrel may have tried to dig up a nut in the frozen soil. Or perhaps our coyote dug up a Meadow Mouse (Microtus pennsylvanicus) before heading off to sleep? I’m not sure because the tracks around it were not fresh; they had been trampled, rained on and frozen. A place where a squirrel may have dug up a nut or seed – or perhaps a coyote found a mouse before bedtime? The coyote tracks did lead away from area toward the private property on the west side of the park. 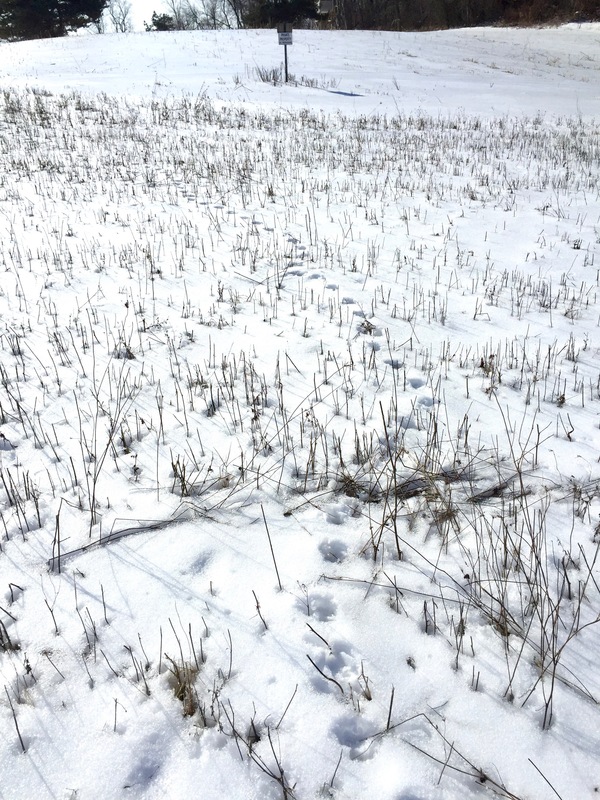 Coyote tracks running through the furrows of the private field on the west side of the park. If the open hole was that of a captured mouse, the birders saw evidence that some mice are luckier than others. Here are some mouse tracks that we spotted near the edge of the western prairie. 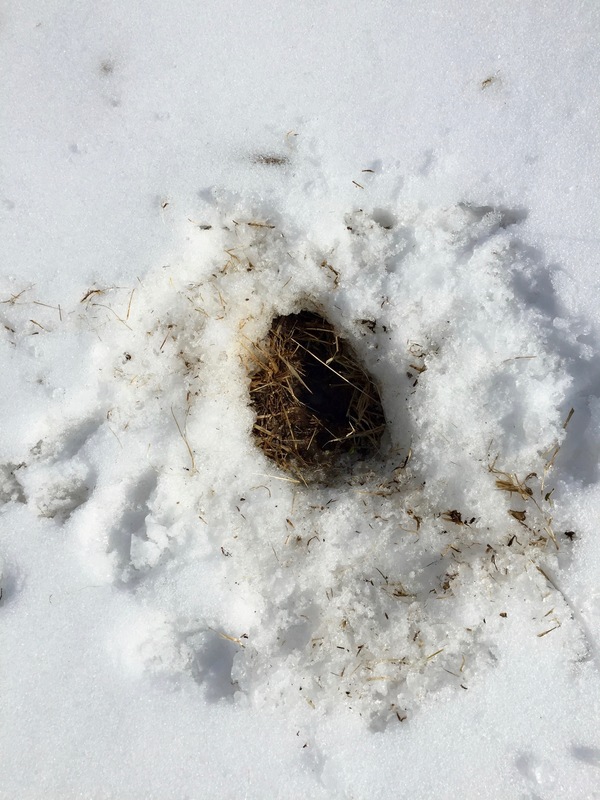 It looks like this mouse made it safely under the snow’s insulation – safe from the icy wind and out of sight. I love the “stitching” look of mouse tracks in the snow. 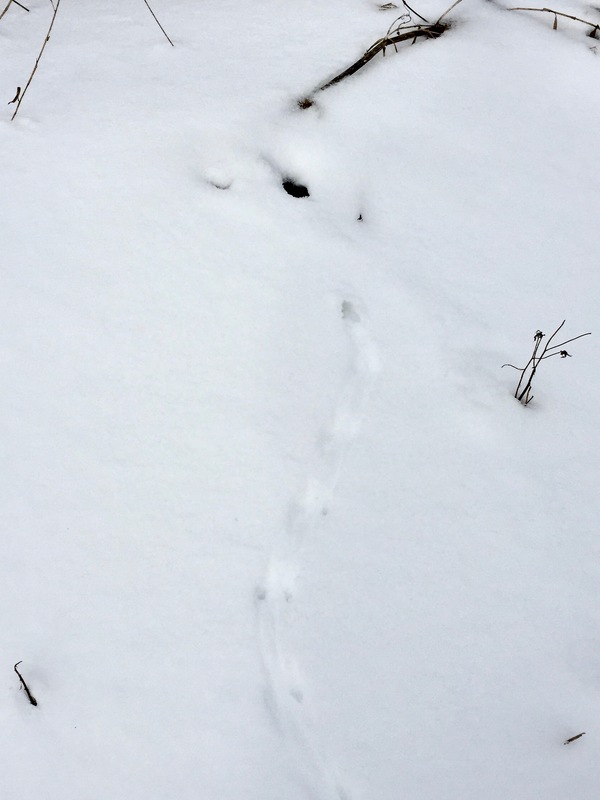 Mouse tracks that look like stitching disappearing into a hole in the snow. 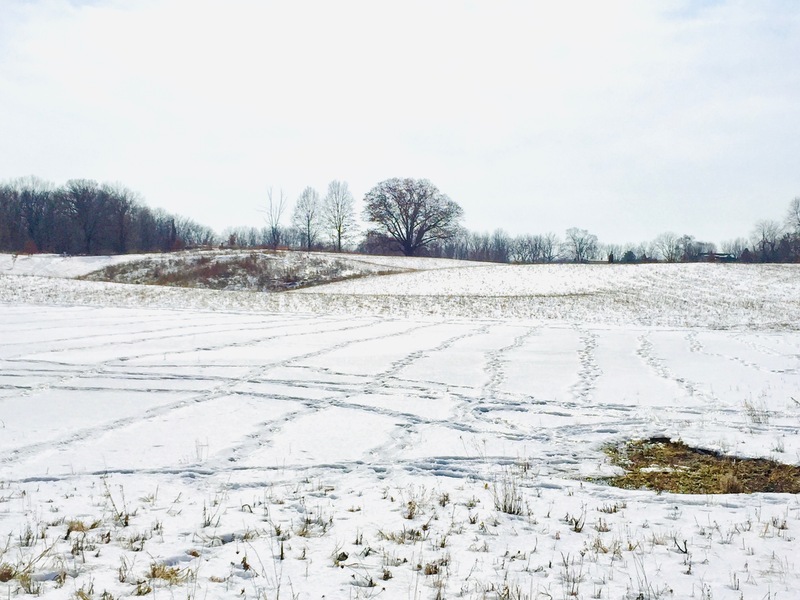 On the last leg of my tracking trip to the park, as I approached the central section from the north, I saw one of the spring-fed ponds covered with lots of tracks, making neat, straight lines across the snow-covered surface. What was going on? And then it occurred to me. These were stewardship tracks! Ben had told us at the end of the bird walk that he’d brought a native wetland seed mix to spread on the ponds before it rained later that day. He and Stewardship Specialist Alyssa Radzwion put the seed right on the frozen surface. 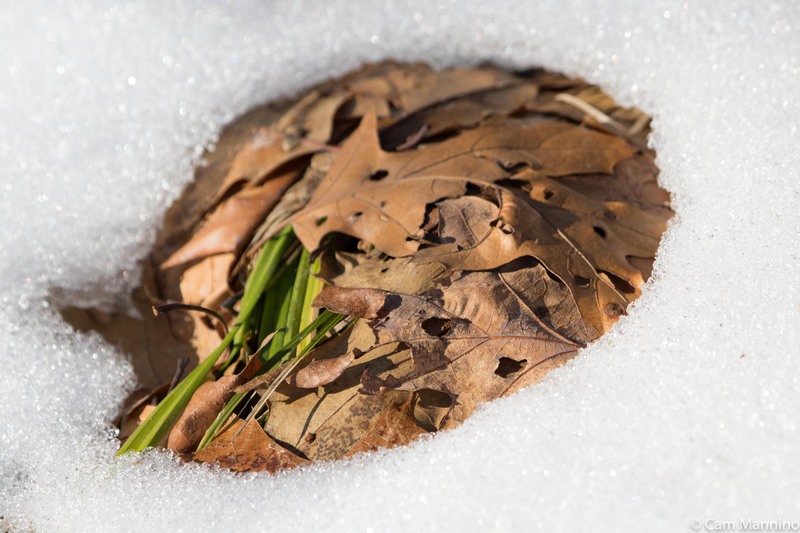 Native seeds needs to be exposed to the cold before they will germinate properly. 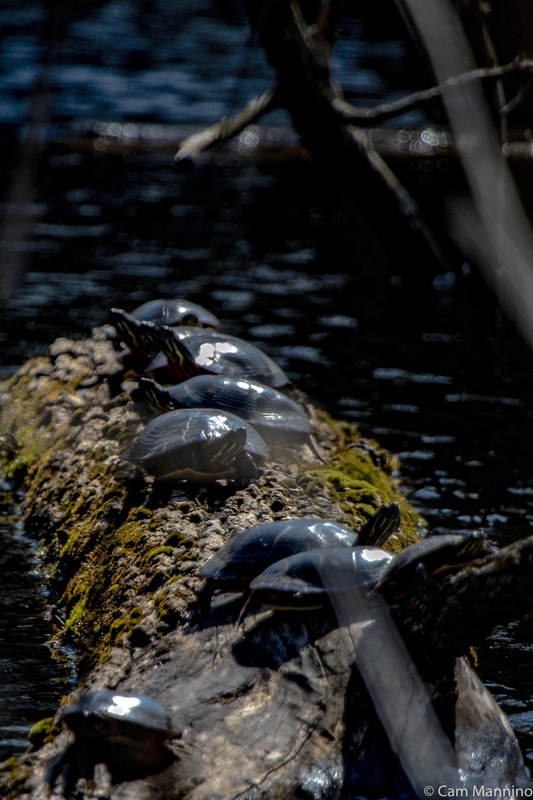 Once warm weather comes, the seeds will drop down into the shallow water or moist edge habitat and with luck, begin bringing some color and native plant life to these special areas of the park. 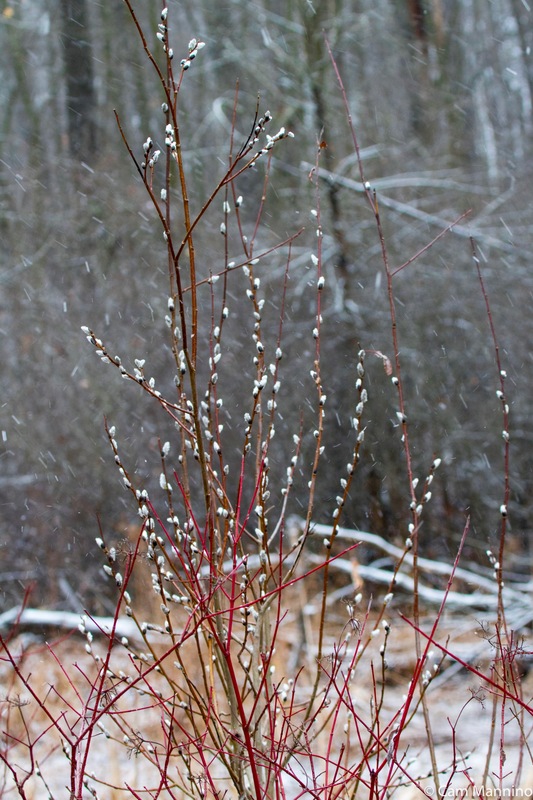 I’ve begun learning to recognize and appreciate the winter forms of some favorite wildflowers. Their subtle shades of brown or gray as well as their patterns and geometry have started me wondering if I could create a native garden next summer that the birds and I could enjoy all year ’round. 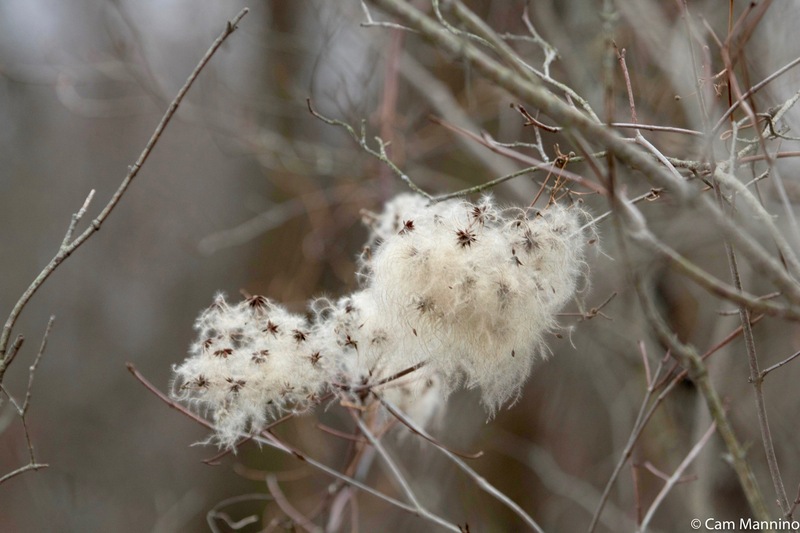 It’s clear that birds need the seeds that cling to native plants despite snow and wind. And I could appreciate the architecture of winter plants. So which shapes provide what landscapers like to call “visual interest” and also provide winter food for wildlife? Yellow Coneflower and Canada Wild Rye in late fall. Perhaps some of you remember how beautiful the Eastern Prairie looked when filled with Black-eyed Susans (Rudbeckia hirta) in the summer. This hardy native has always had a special place in my life. When I was a teenager, the first song I ever wrote included the “wide-eyed stare” of this sunny flower. So it definitely needs to be in my garden. I’m taken with its winter fringed cap in winter and would be happy to let it hang out in my garden. Mixed in with these bright yellow beauties were the lavender fireworks of Bee-balm (Monarda fistulosa) and they create appealing geometry in a winter landscape. For contrast, I’d need some white in my summer garden – and maybe good old Yarrow (Achillea millefolium) would be a possibility – if I could keep it from spreading too much. I like its chocolate brown against the white snow. I love how Yellow Coneflowers (Ratibida pinnata) sway in a summer breeze so I hope they’ll be included somehow too. 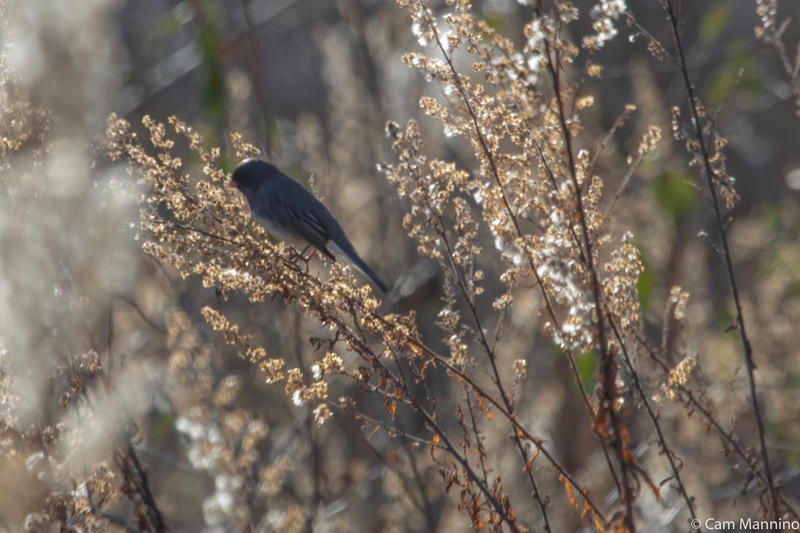 The plump, oblong seed heads obviously provide forage for the birds and silvery, pointed spears would be a graceful accent in a winter garden. I love the graceful pointed heads once all the seeds have fallen. Brown-eyed Susans (Rudbeckia triloba), which also bloom late in late summer and fall, might be another good choice for the field, since they grow so tall (compared to Black-eyed Susans) and have a branching form with multiple blooms at the same time. Brown-eyed Susans in winter. Here you can really see their height and their branching structure. Well, that’s a start. I want to search out some other favorites, like Foxglove Beard-tongue (Penstemon digitalis) and see what it looks like after bloom – though I doubt I can resist it for the garden. 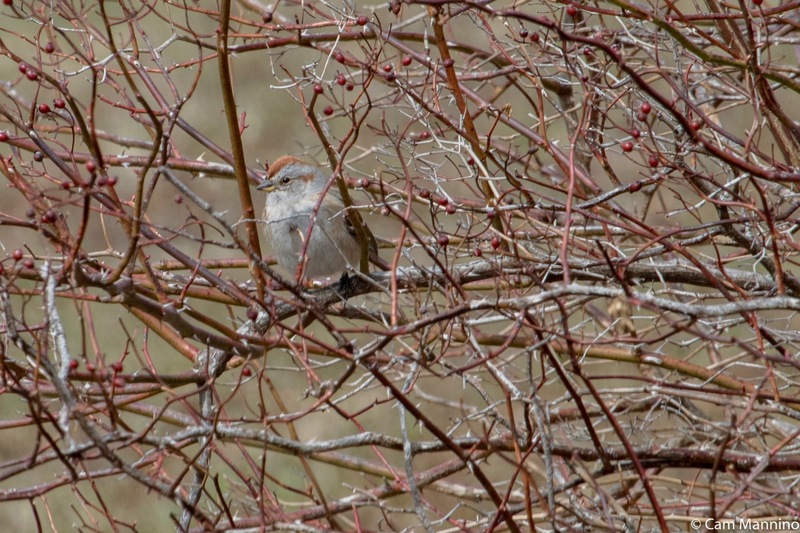 That little Field Sparrow (Spizella pusilla) makes me impatient for spring! 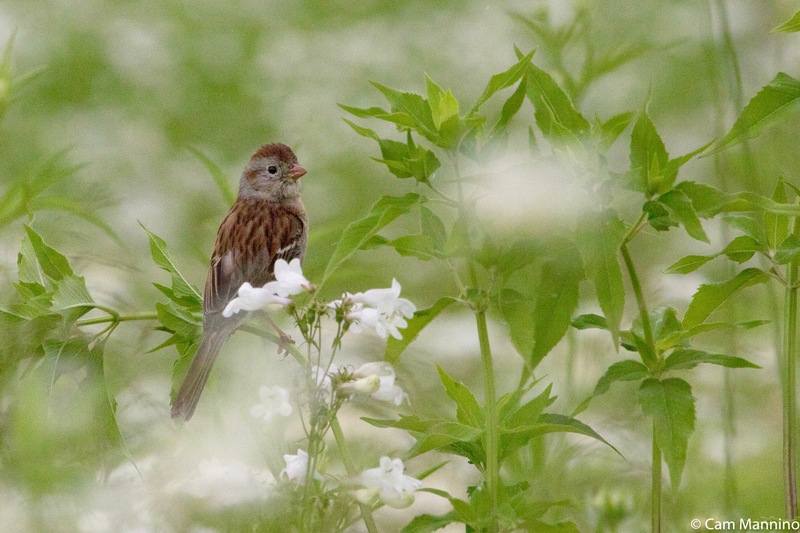 A young Field Sparrow on Foxglove Beardtongue in Charles Ilsley Park’s Eastern Prairie. It takes a bit more effort to get out on a frosty morning. 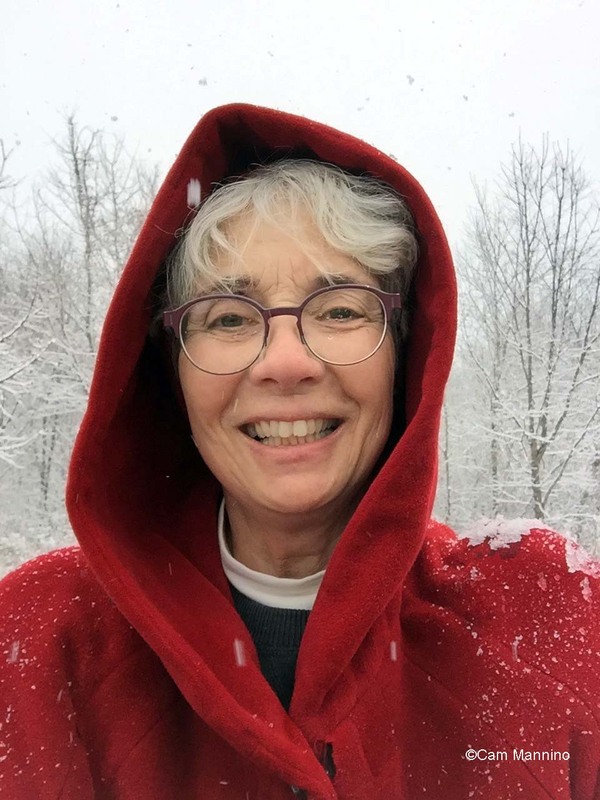 There’s all that layered clothing and boots and gloves and scarves. And the early March landscape is getting just a bit tiresome — too much brown and white out our windows. But once I’m out the door and into the landscape, nature offers me a few treats to keep me coming back. 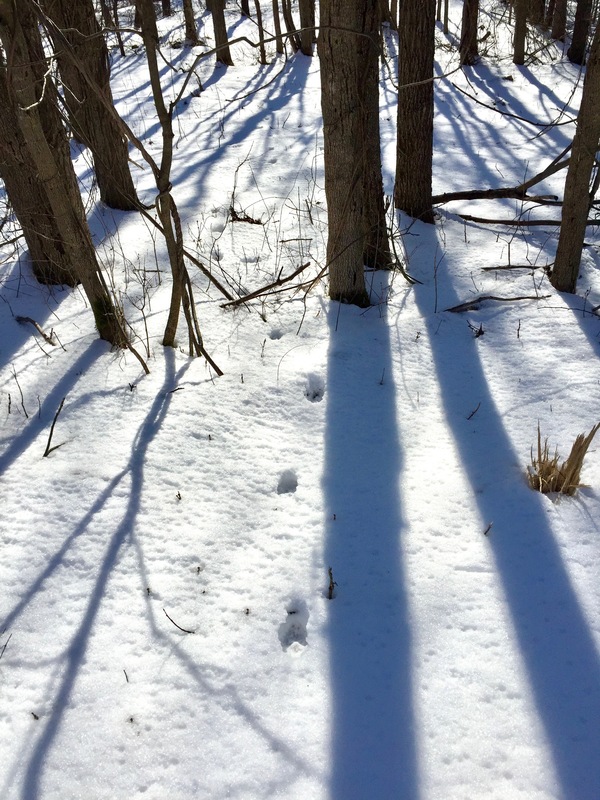 Tracking a coyote’s tracks to a secluded pond in the woods feels like a little adventure. 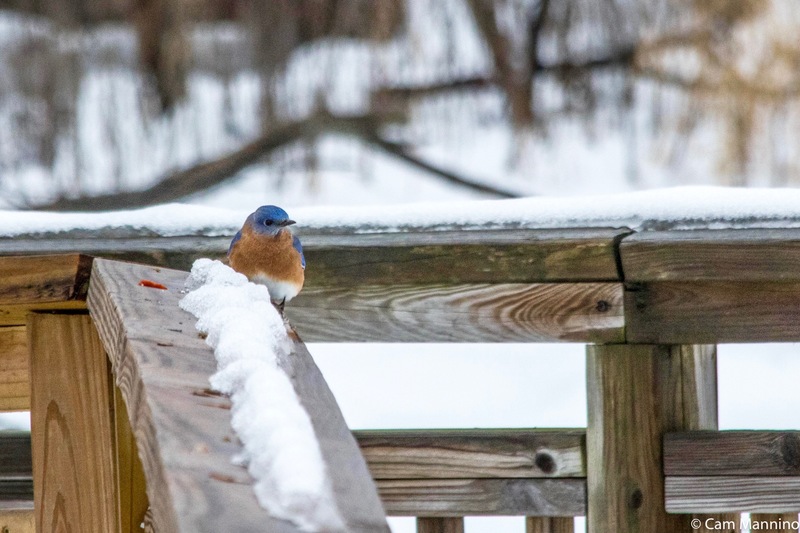 The friendly chatting of winter birds keeps me company and the sight of bluebirds in the stark landscape nourishes my color-starved eyes. And how lucky that noticing the winter geometry of last summer’s blooms sets me off dreaming about a new native garden! So all that makes crunching step-by-step through the snow crust worth the effort when the thermometer encourages me to stay home. 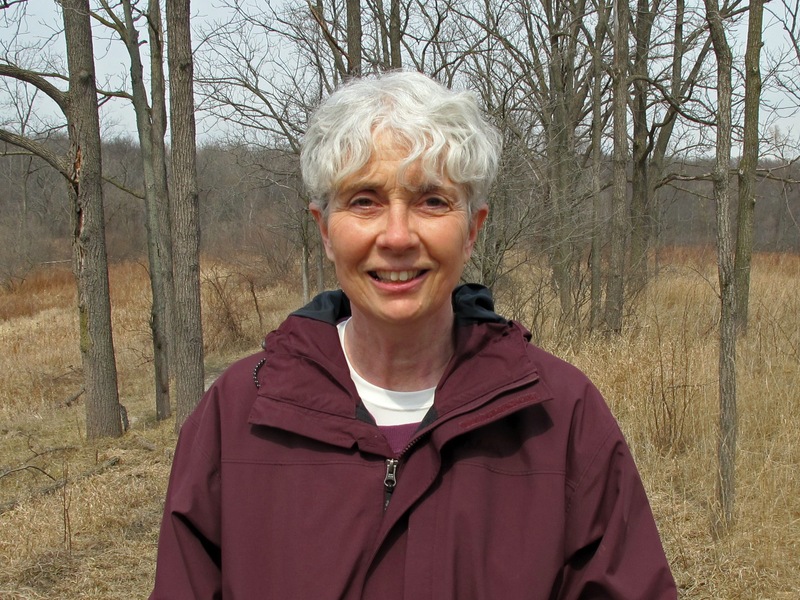 Footnote: My sources for information, besides Oakland Township’s Stewardship Manager Ben VanderWeide, are as follows: Allaboutbirds.org, the website of the Cornell Lab of Ornithology at Cornell University; Wikipedia; A Field Guide to Nature in Winter by Donald Stokes, and Trees of Michigan Field Guide by Stan Tekiela. 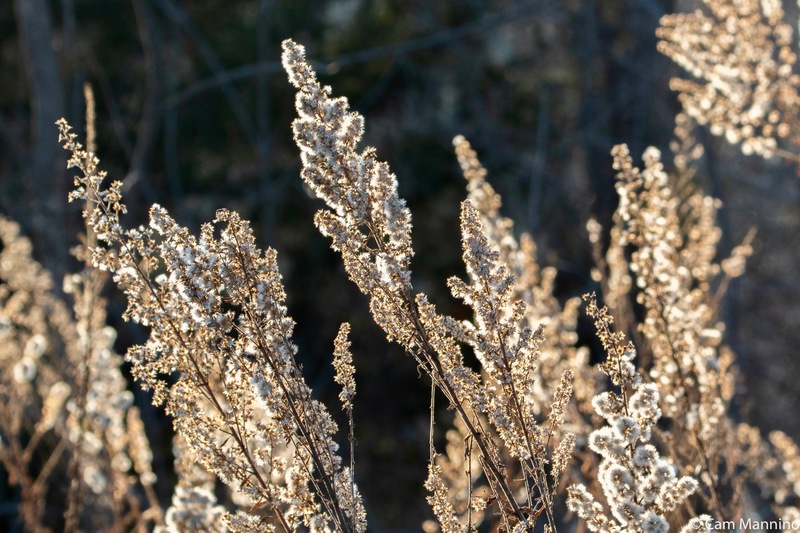 On a frigid late afternoon a week or so ago at Draper Twin Lake Park, I came upon a large stand of Showy Goldenrod (Solidago speciosa) glowing in the sunlight. It turned out that I was not the only one enjoying that warm patch of sunlight backlighting plumes of goldenrod. 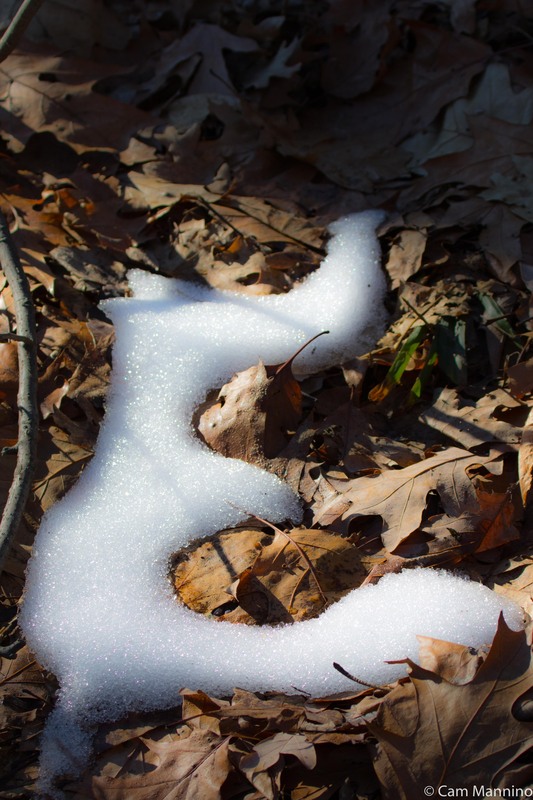 That sunny curve in the trail was alive with winter birds! Tree Sparrows (Spizelloides arborea) twittered cheerfully back and forth in the grass below the plants, foraging with the sunlit stems swaying above them. 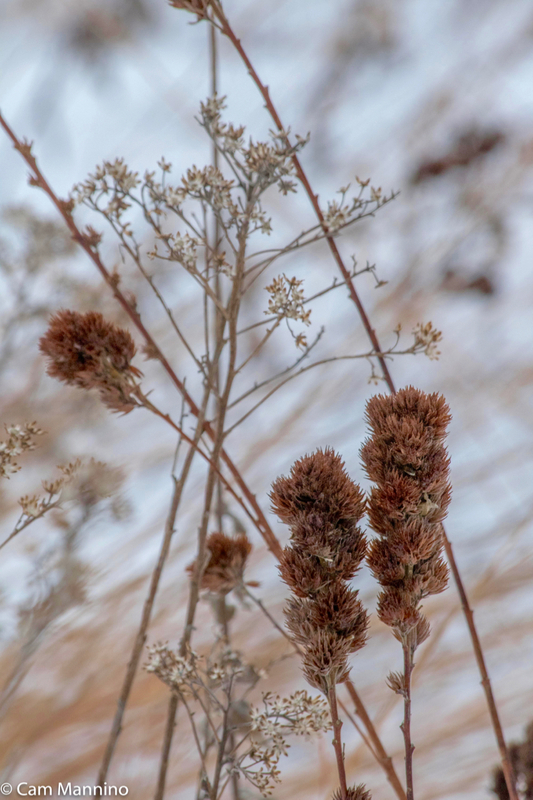 These cheery-voiced winter visitors from the far north were landing on the goldenrods and nibbling at the seed heads. 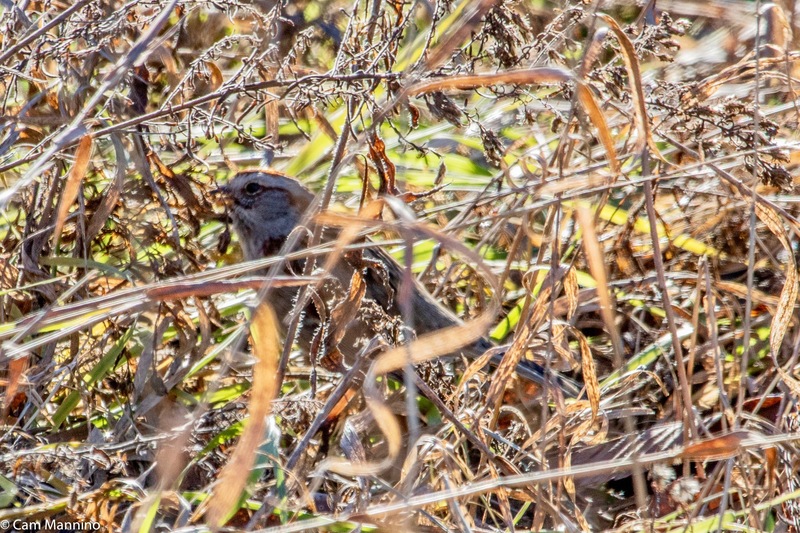 That made some of the seed fall to the ground, where the tree sparrows prefer to feed, so the tall grass below rippled with busily foraging members of the flock. And Tree Sparrows hung out in the bushes and trees nearby waiting their turn, some gathering a little warmth on their breasts from the setting sun. A Tree Sparrow in bright sunlight with a dark twig shadow across its face. 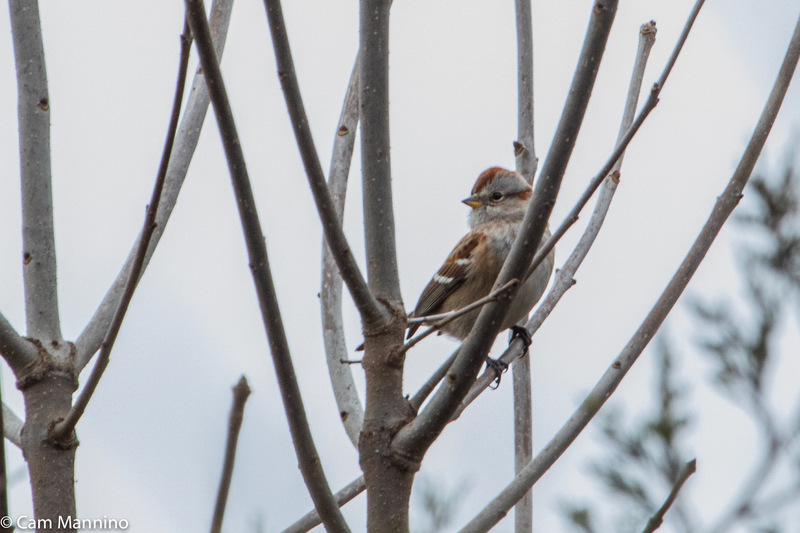 An American Tree Sparrow in a nearby tree while clouds blocked the sun. This picture clearly shows the two-colored bill, rusty cap, rusty eyeline, and unstreaked breast that we use to identify tree sparrows. They weren’t the only species enjoying that patch of sunlit goldenrod, though. Another winter visitor from Canada, a Dark-eyed Junco (Junco hyemalis), swooped into the lit plumes and began sampling the seed heads. 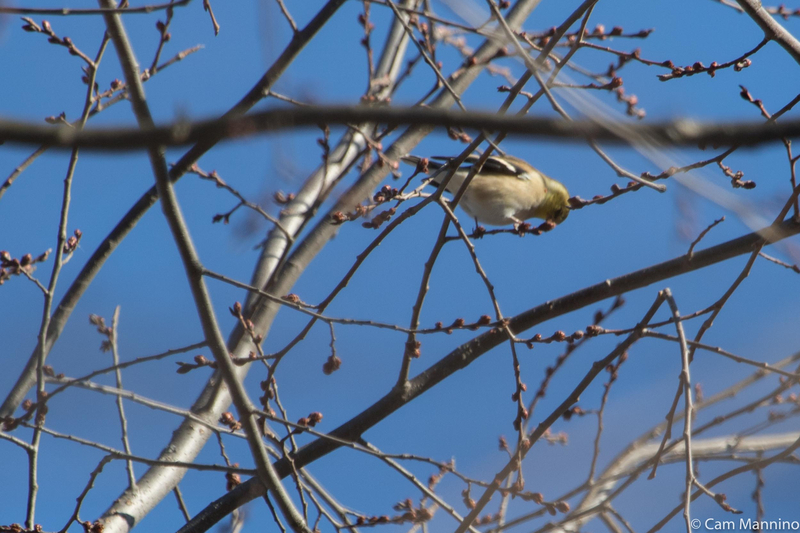 In the background, a tentative American Goldfinch (Spinus tristis), dressed in its sedate winter plumage, waited its turn too. So many birds being fed at once! I imagine they all enjoyed the faint warmth of the winter sun shining through the plumes as they ate their evening meal. An American Goldfinch waits for its turn to share the goldenrod seeds. 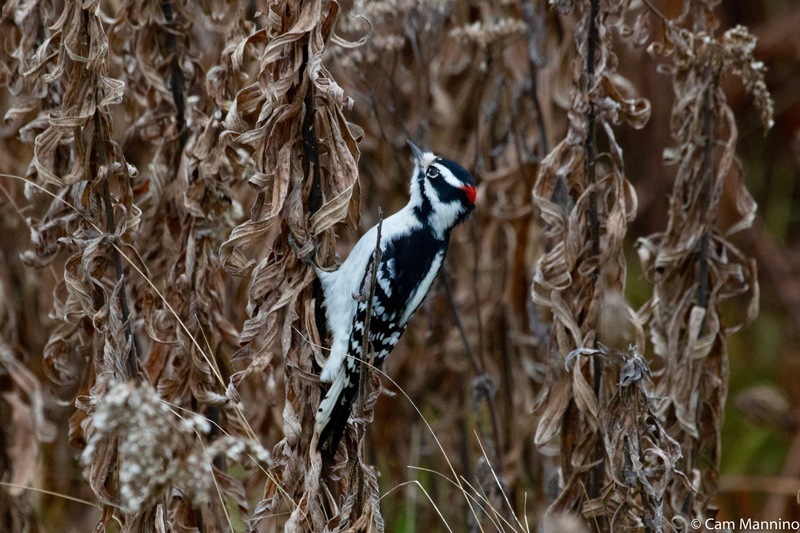 A male Downy Woodpecker (Dryobates pubescens) preferred to look for insect eggs or larvae in the stems of Canada Goldenrod (Solidago canadensis). He moved quickly from plant to plant pecking furiously. Later in the winter, I often find goldenrod galls with neat holes in them where Downys have excavated larva from their winter hideaway inside. But this Downy Woodpecker was searching for something inside the stems themselves. 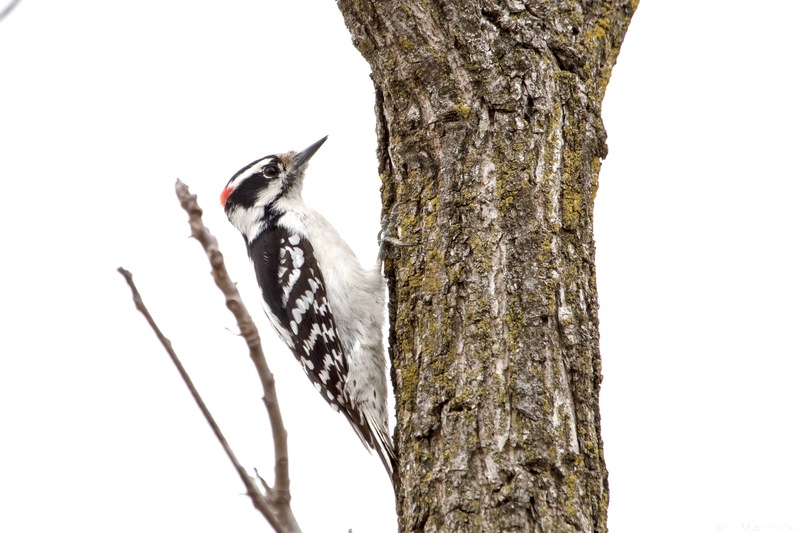 A Downy Woodpecker pecked at the stems of Canada Goldenrod, looking for insect eggs or larvae. 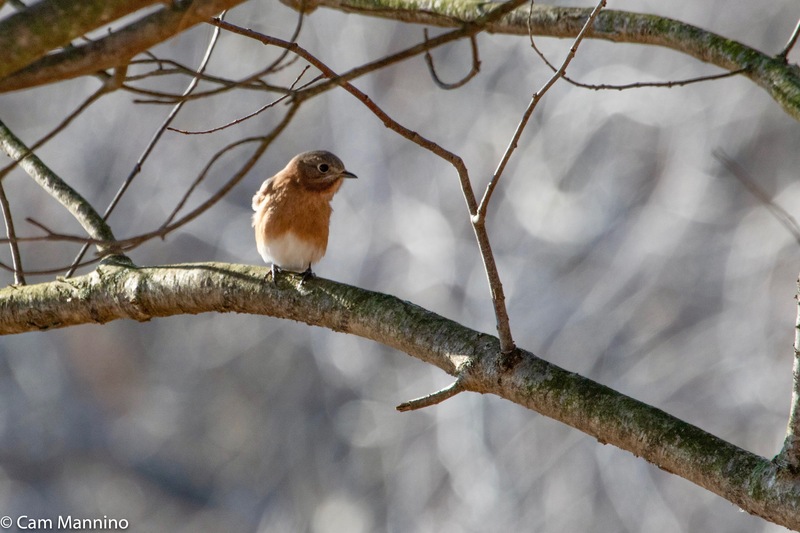 A female Bluebird checked out a nestbox on the prairie. Her mate waited nearby, occasionally diving into the grass to feed in the meantime. Later I saw a female – perhaps the one from the nest box? – pecking on a branch until she loosened a frozen, tiny green caterpillar, which she then promptly swallowed. She was so busy pounding on its hard surface that I never got a clear photo of the caterpillar in her beak – but here she is just after eating her frozen dessert. Looks like it might have felt a bit chilly on the way down, doesn’t it? A female bluebird who’d just found and consumed a bright green frozen caterpillar! 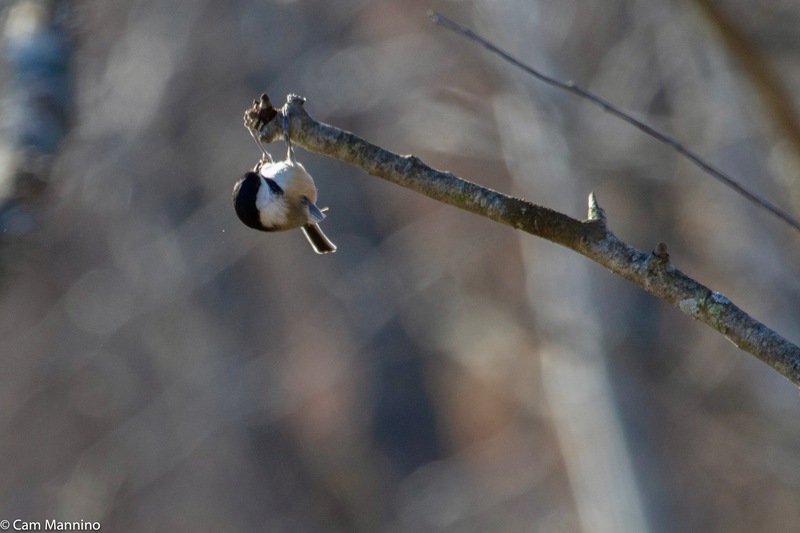 In the same clump of bushes, a Black-Capped Chickadee (Poecile atricapillus) performed acrobatic feats while trying, it appeared, to extract some kind of insect from the end of a twig. Here it is hanging upside down as it pecked diligently for its supper. 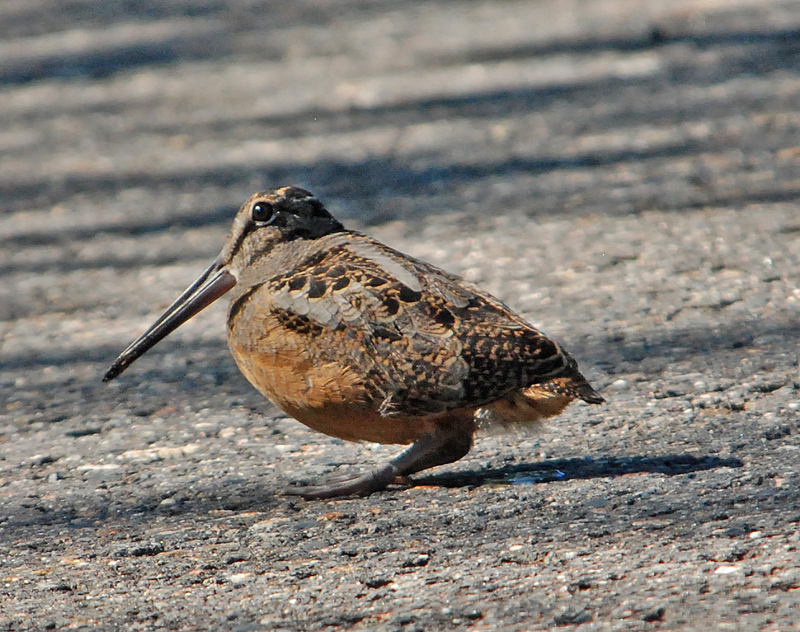 I love its feathered leg-warmers. 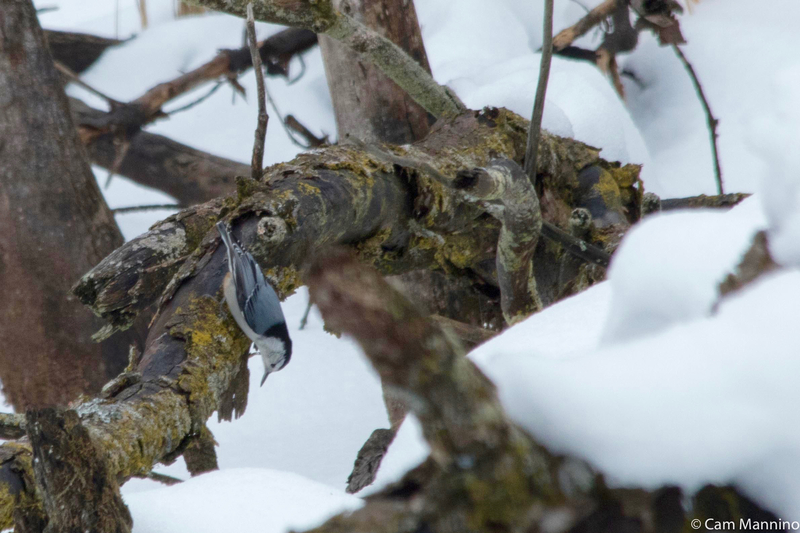 A Black-capped Chickadee pecked at the end of this twig until something to eat came out of it. Snow, ice, sleet, rain – all the elements of Michigan’s traditional “January thaw.” Sigh…Gray skies day after day make me crave color! 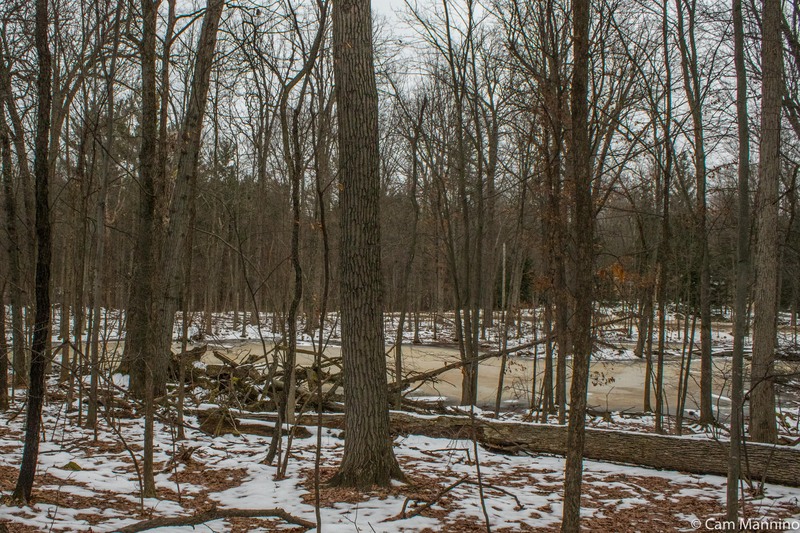 On multiple jaunts at Draper Twin Lake Park – some icy, some muddy – I sought it out. As usual, the mushrooms provided a surprising splash of color here and there. 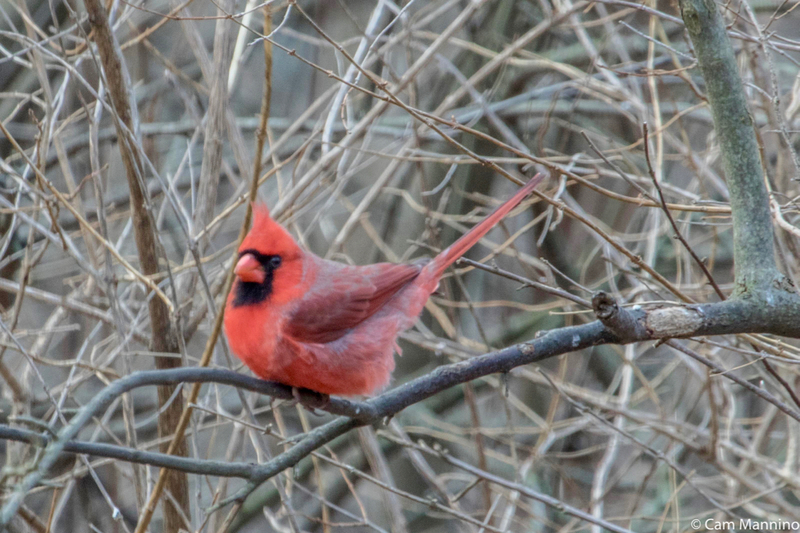 Birds in varying shades of red relieved winter’s gray. And changing ice designs added a bit of artistry to every visit. Hey, we take what we can get in beauty at this time of year, right? 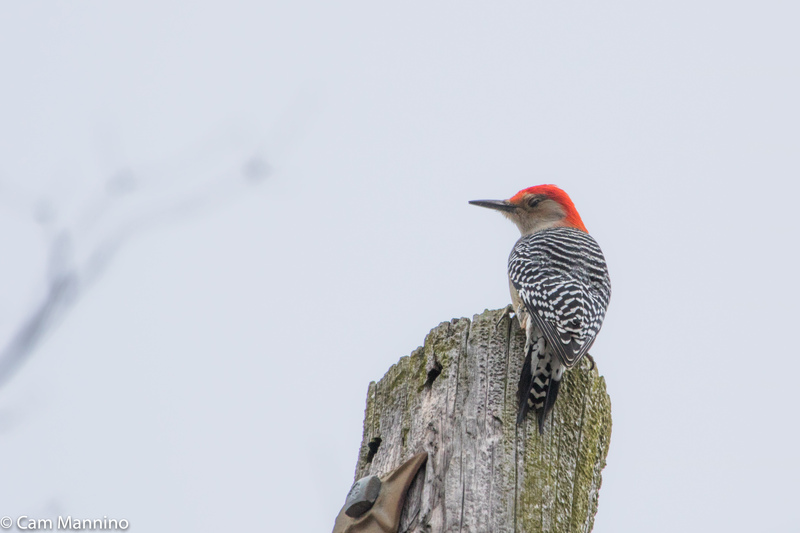 A Red-bellied Woodpecker (Melanerpes carolinus) drummed noisily on a telephone pole on the eastern side of the park. Let’s hope this male had a cozy hole to spend the winter night; the starlings, twittering in a thicket nearby, are known for absconding with holes created by Red-Bellies. 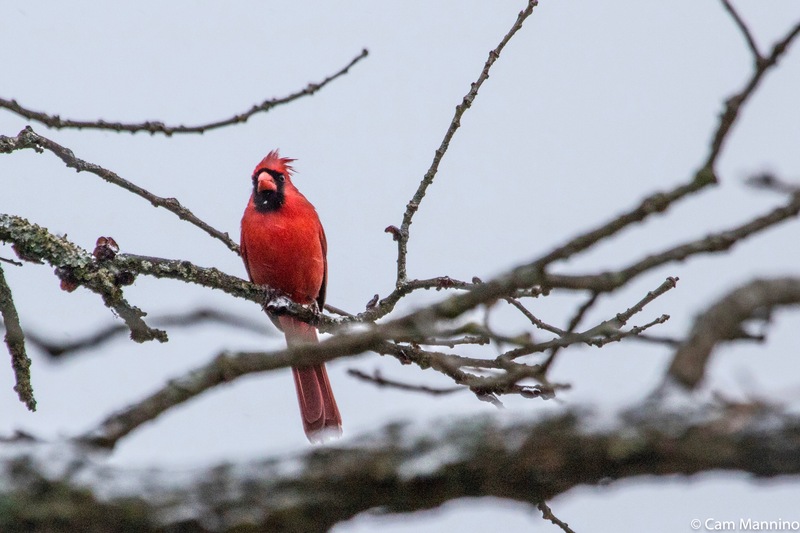 This guy’s red cap glowed against a gray sky – a good omen for someone questing for color on a dark day! 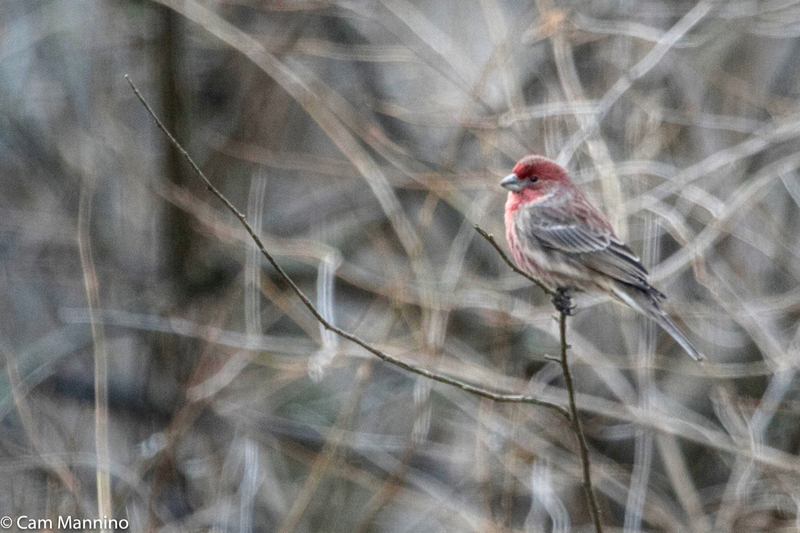 On the way to the marsh, a chorus of House Finches (Haemorhous mexicanus) chirped from the shrubbery. These gregarious birds with their rosy males added both color and the friendly sound of their “chatting” to the gray quiet. 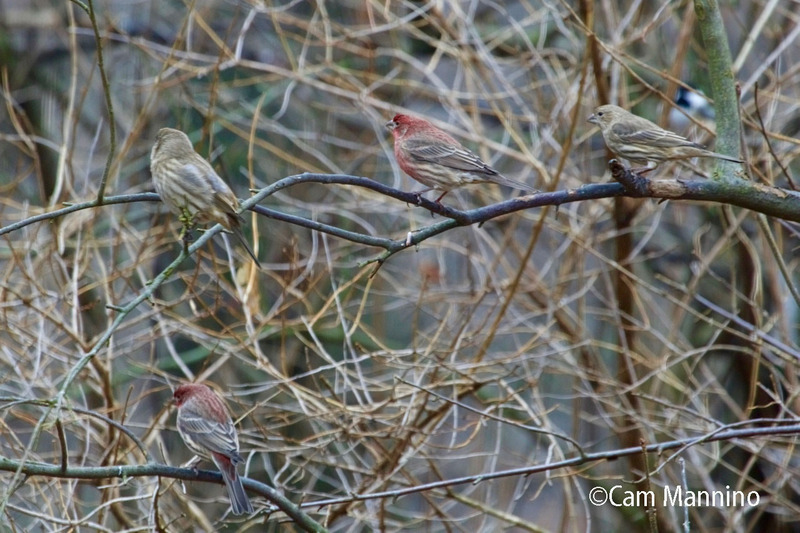 House Finches pause to busily crush the seeds they find with quick bites, making them easier to spot and photograph. 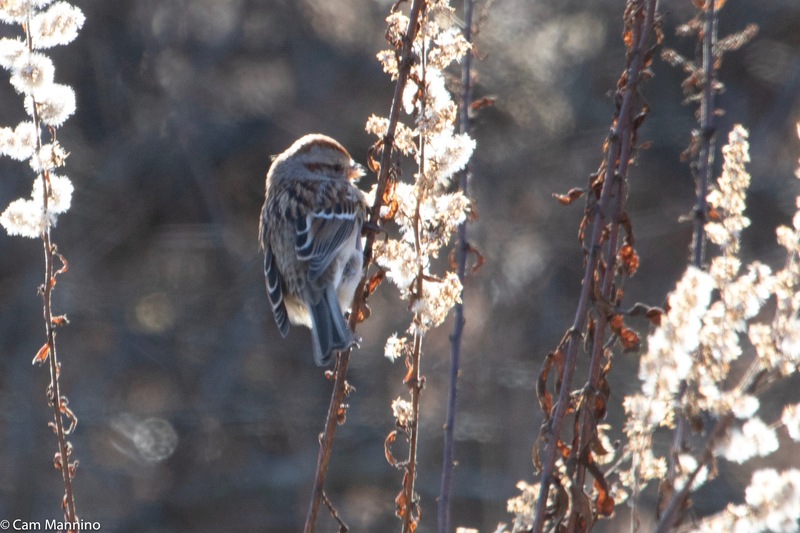 A group of House Finches chirped among the shrubs on the path to the marsh on Draper’s east end. 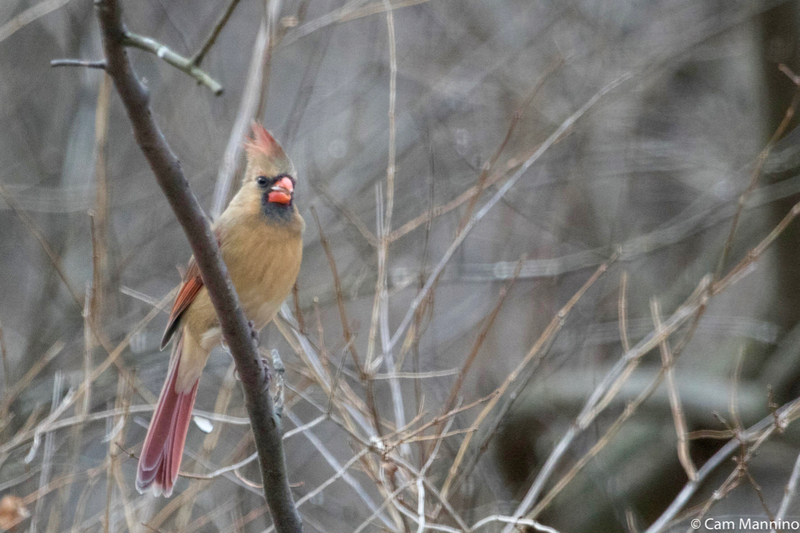 A male Northern Cardinal (Cardinalis cardinalis) added a gorgeous dash of scarlet as he darted among the shrubs along the marsh edge at the bottom of the trail. 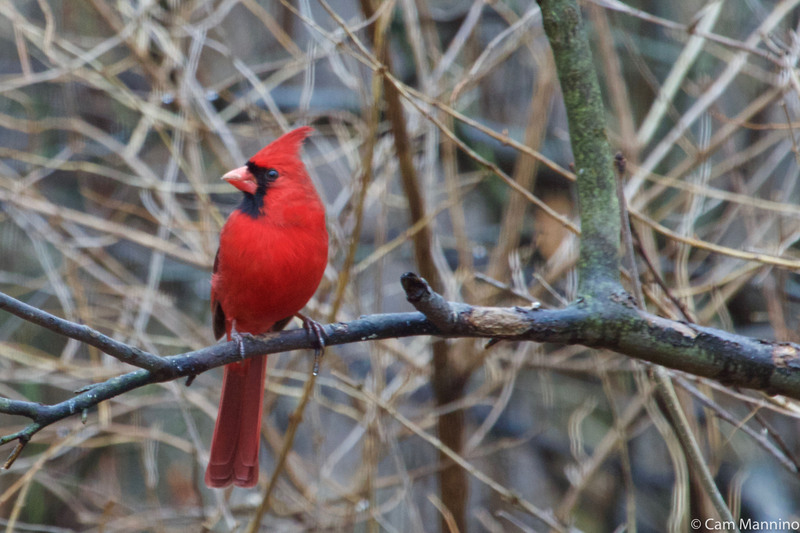 The scarlet of a male Cardinal offers a welcome break from gray on a winter’s day. 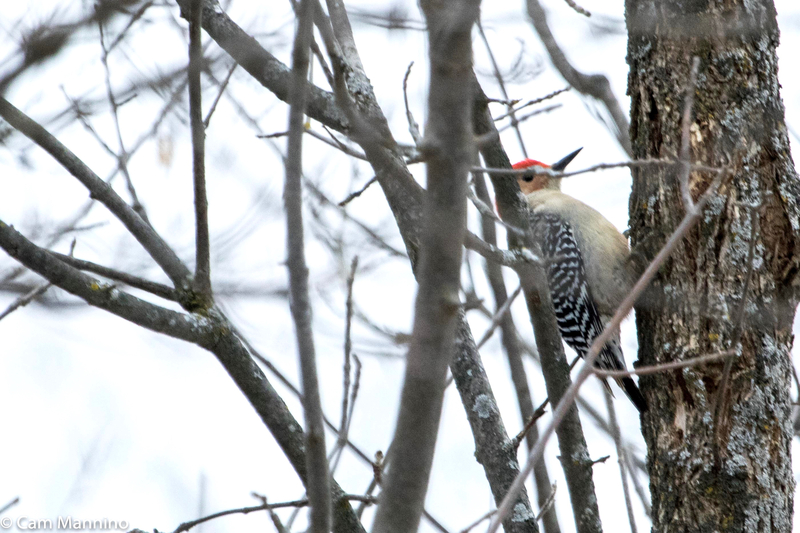 While at the marsh, I was surprised to hear what I think was the call of a Northern Flicker (Colaptes auratus) in the distance. 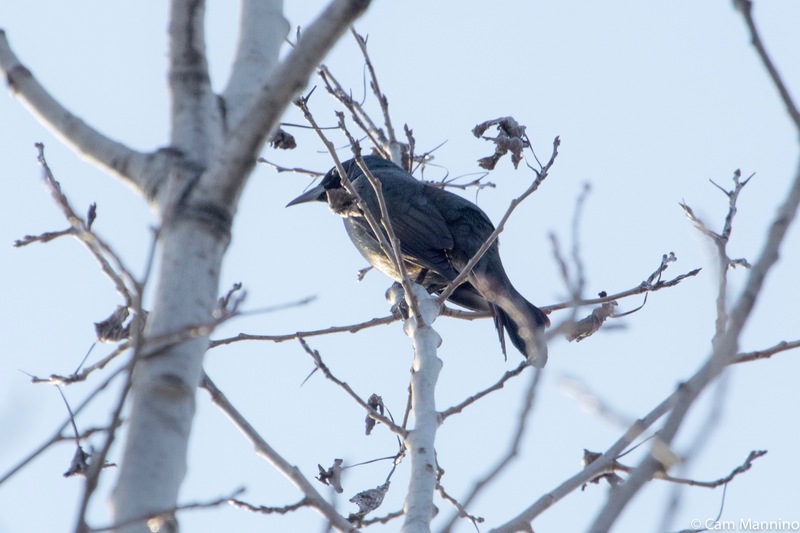 The birders saw one at Charles Ilsley Park the previous week but I’ve never seen one in the middle of winter. 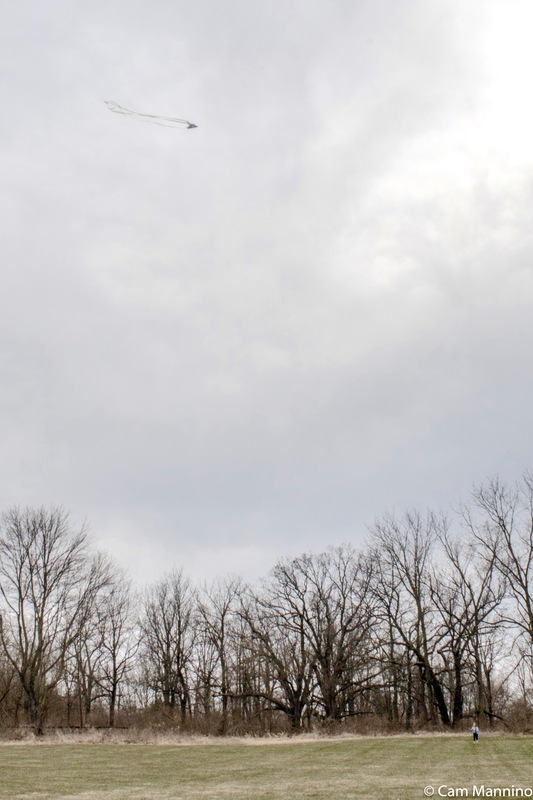 If you listen to the “Rolling rattle call” at this Cornell Lab link, you’ll hear what I heard far away on a wintry day. Here’s a flicker I saw in early spring last year. 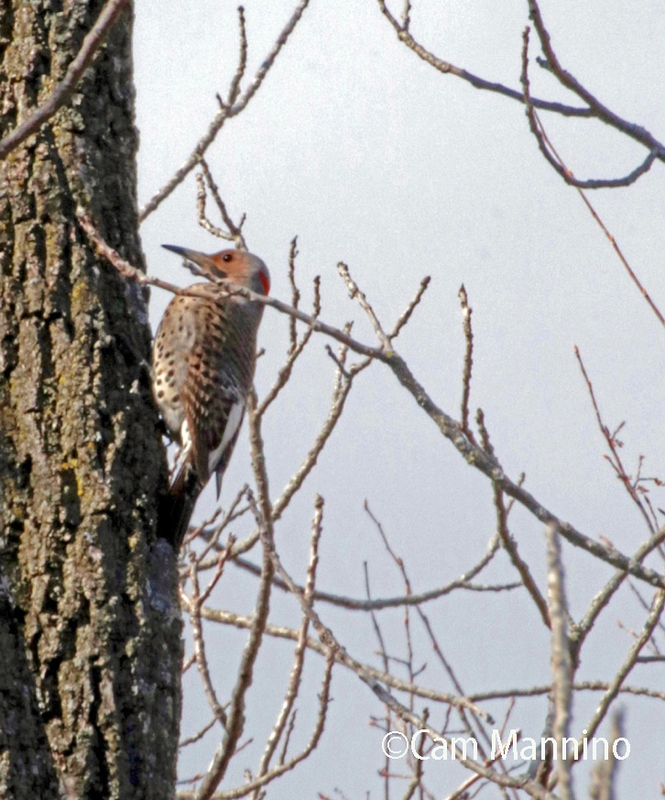 A Northern Flicker could be heard in Draper Park last week, but I never saw it. This photo is from the previous spring. 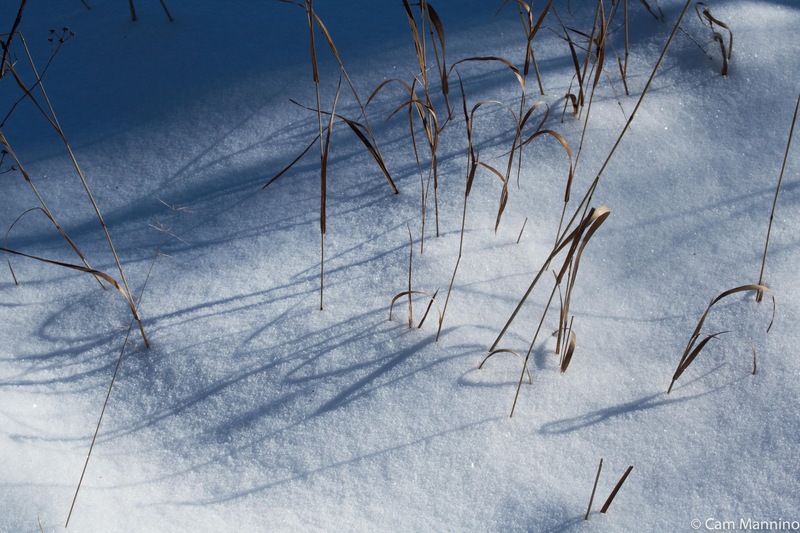 Out on the ice, a graceful swoop of marsh sedges turned blue and silver in the shadows. The sedges in the marsh seemed tinged with blue in the shadows of a winter afternoon. 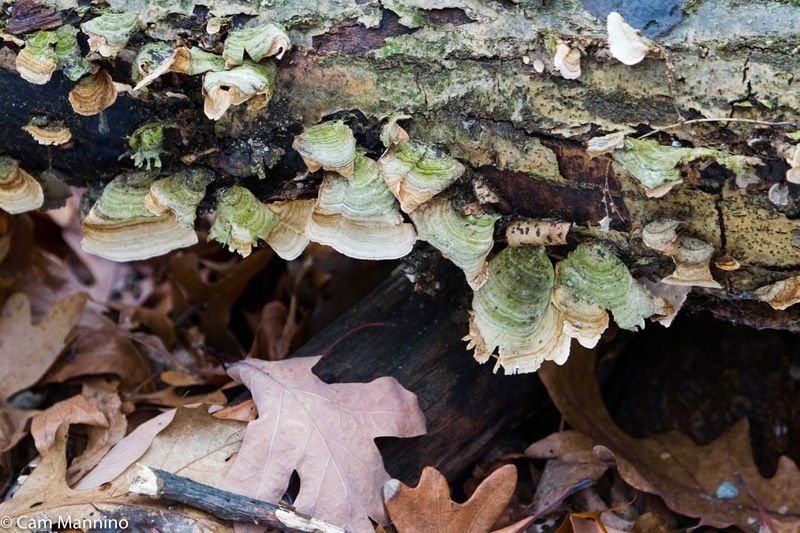 On a log near the marsh, a bright patch of yellow polypore/shelf mushrooms glowed under the edge of a log. 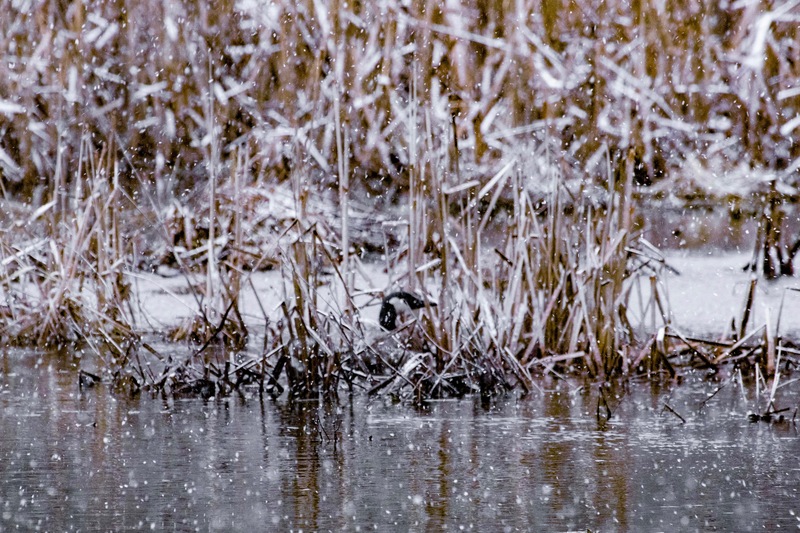 One of the reasons I love wetlands is that summer and winter, they reward any hiker with colorful birds and mushrooms. Yellow polypore mushrooms on a log near the eastern marsh at Draper. But birds were there too. 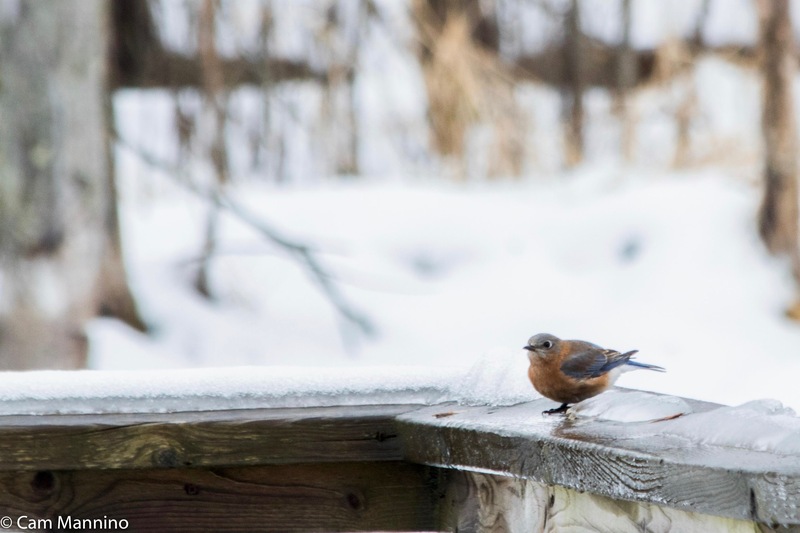 Flocks of modestly dressed winter visitors – Dark-Eyed Juncos (Junco hyemalis) and American Tree Sparrows (Spizelloides arborea) – hopped down from small bare trees and bushes, chattering away as they foraged on the ground. Juncos foraged for seeds, though this one seems to have a piece of leaf in its beak! A Tree Sparrow waits in the bushes. 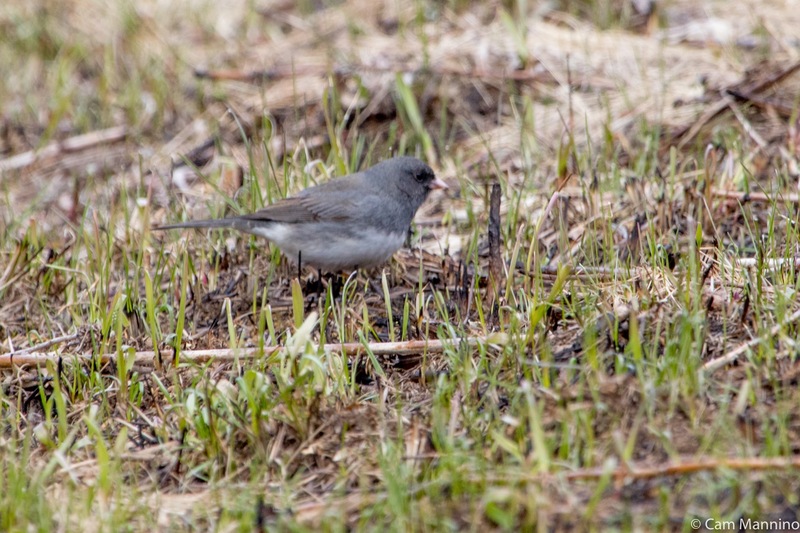 That bit of leaf in the Junco’s beak may be result of flipping things over to look for seeds. The seeds of two native wildflowers left in the field looked as though they may have provided some sustenance. The seed pod of Wild Senna (Senna hebecarpa) on the left below and the dried inflorescence of a late-flowering Black-eyed Susan (Rudbeckia hirta) on the right are both native plants sown in 2015 by Ben VanderWeide, our Stewardship Manager, to restore the prairie, using a grant from the Fish and Wildlife Service. Wild Senna pods provide winter food for birds. This head of a Black-eyed Susan looks like it’s dropped its seeds for the birds as well. Over the crest of a slope on the rolling prairie, a slow, lumbering Possum (Didelphis virginiana) nosed its way along the edge of the field. 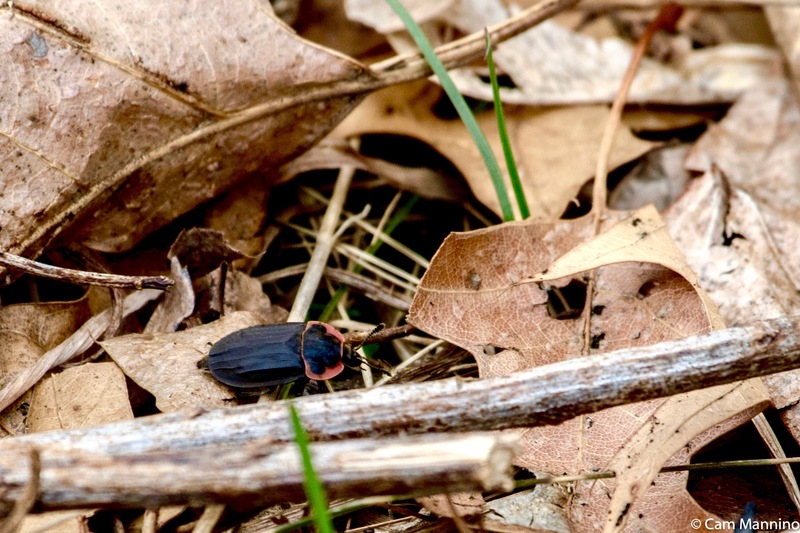 It appeared to be searching for seeds or earthworms on the wet earth exposed by the thaw. 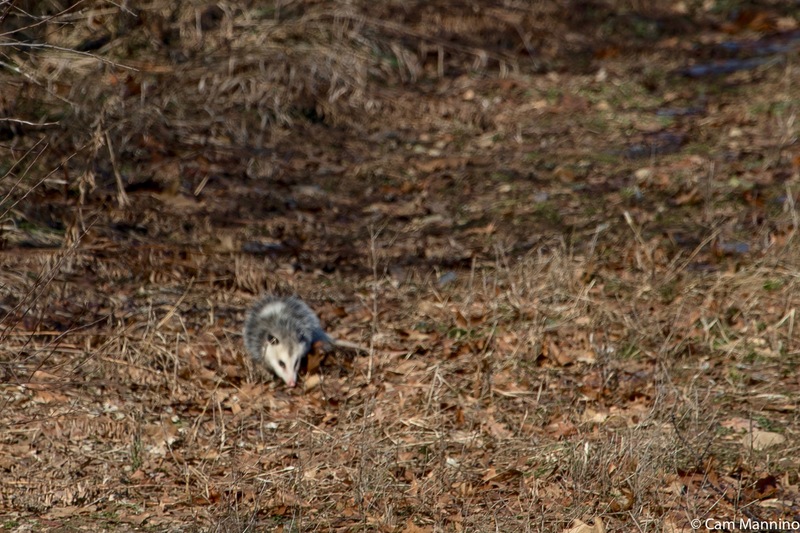 Possums don’t hibernate and are generally nocturnal, but there it was in morning light. Possums feign death (“playing possum”) when extremely frightened – but they’ll fight first – so be wary of their sharp teeth. North America’s only marsupial, possums raise their infants in the female’s pouch for about two and a half months. Later, the babies, up to 13 of them, can be seen draped over their mother’s back as she goes about her business. 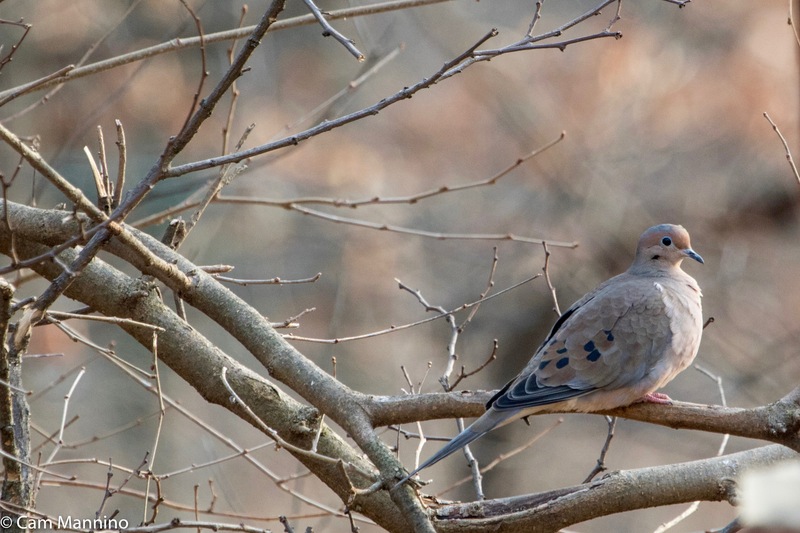 In a tree at the edge of the prairie one morning, a lone Mourning Dove (Zenaida macroura) blended its soft pinks with the gentle shades of the winter landscape. 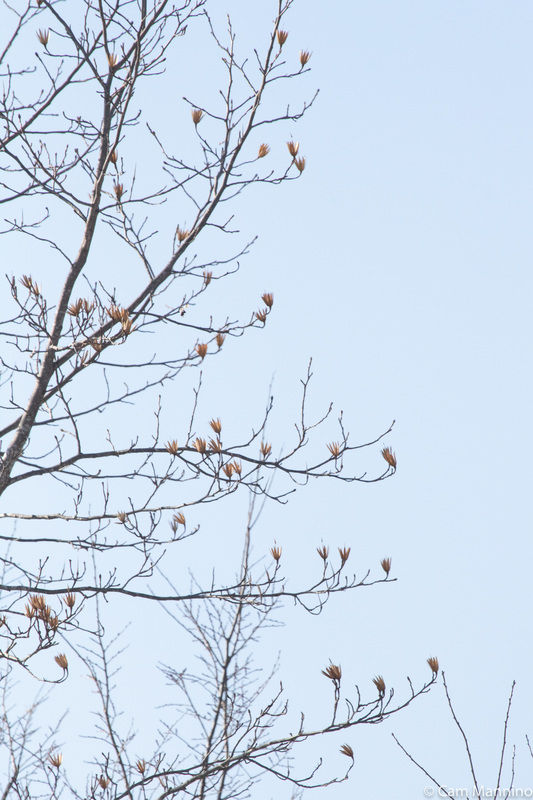 A Mourning Dove’s colors blend with the shades of a winter morning. 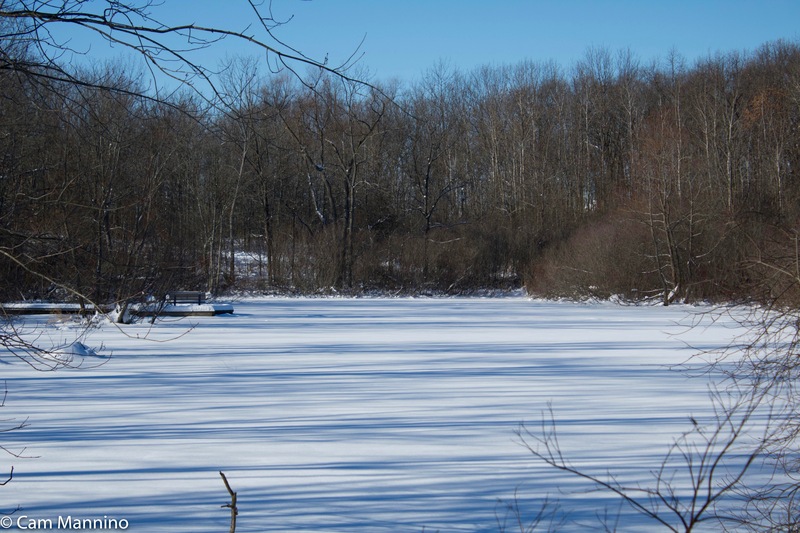 The western path was a bright glare of ice on my first January trip to the pond. 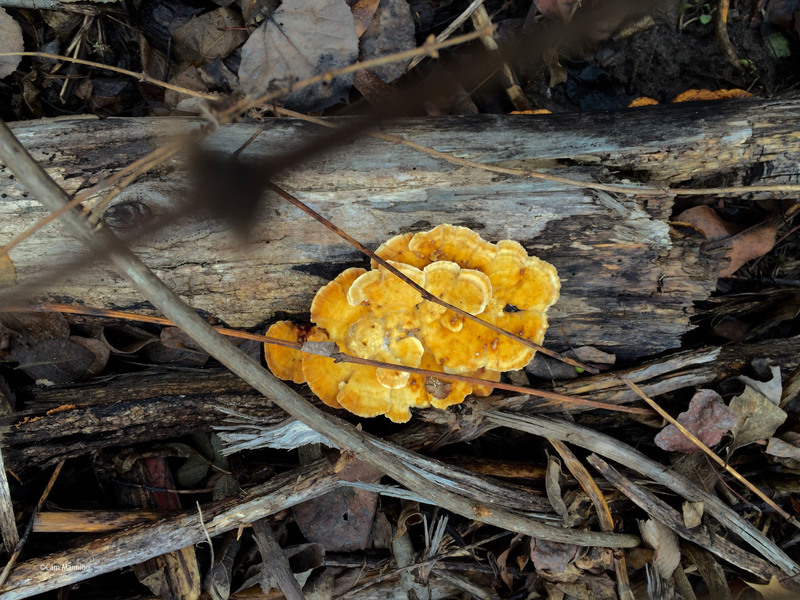 At the edge of the parking lot, a dead branch still sported orange polypore/shelf mushrooms, just as it did in the fall. 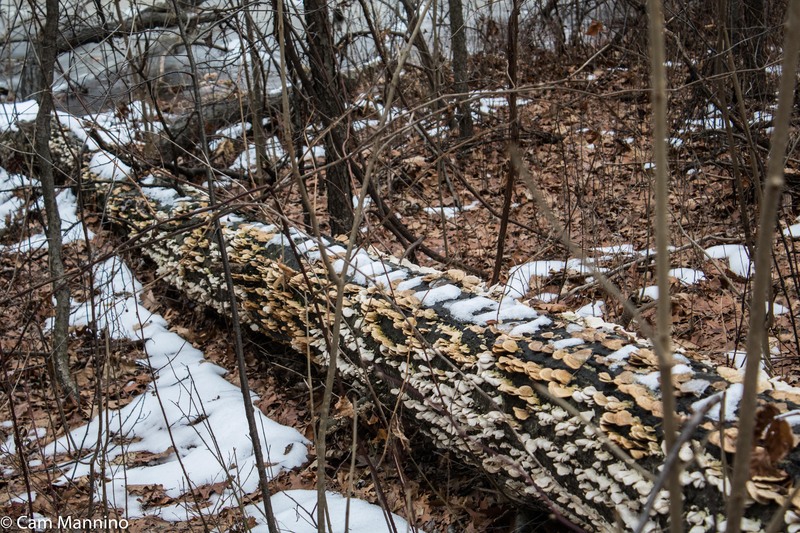 Amazing how hardy these fungi are in cold weather! 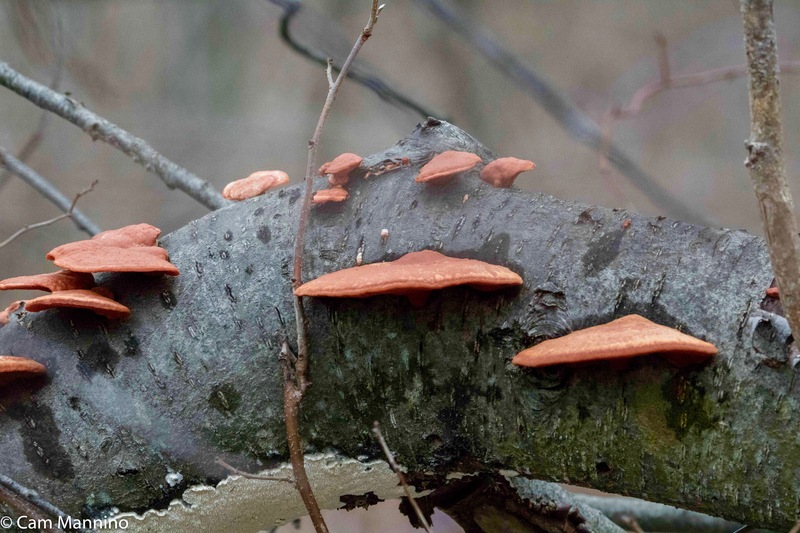 The orange polypore (“shelf”) mushrooms survived the cold intact, perhaps even getting a bit more orange! A stick covered in a mosaic of green and blue lichen and a nearby patch of leafy (foliose) lichen caught my eye. Lichen are intriguing, because they are a “composite organism” made up of algae and/or cyanobacteria living among filaments of a fungus in a symbiotic relationship. The fungus provides protection for the algae and gathers moisture and nutrients. The algae uses those nutrients and energy from the sun, and through photosynthesis produces food (carbohydrates) for both itself and the fungus. These ancient organisms occur from alpine regions to sea level in all kinds of shapes (morphologies). The more delicate forms of lichens are very sensitive to air pollution (bio-indicators), which is why you will only find flatter forms that colonize rocks and branches in areas with more air pollution. In areas with cleaner air you’ll find more delicate, branching lichens. I’m just glad they gave me some varying shades of green and blue on a wintry day. Blue and green lichen growing on a stick in the path. Foliose (leafy) lichen is a composite organism of a fungus and algae living in symbiosis. Near the pond during a bird walk, a bright yellow mushroom beckoned in the distance. How’s this for a bit of sunshine on a moist winter morning? I’m no expert at mushrooms, as readers know. To me, it looks like kernels of corn. 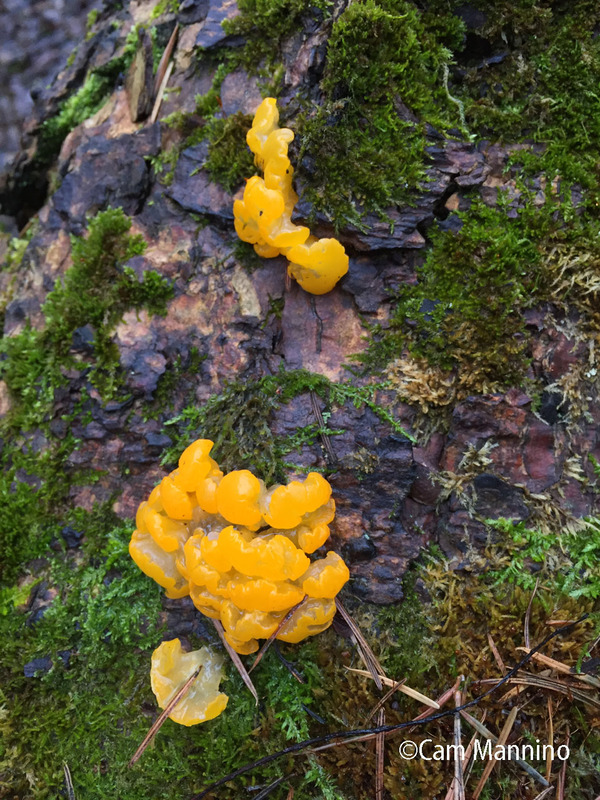 But I think this one’s common name is “Witches’ Butter,” Dacrymyces palmata (Fungi get more imaginative names than plants do…). Any mycologists out there who can verify that for me? Lovely russet patterns formed on the path, made from White Pine needles (Pinus strobus) and a variety of leaves embedded in ice near the lake. A strange ice sculpture took shape along the floating deck at the lake. I dubbed it the “Sunny Side Up” formation when I first saw it on an icy day. When I came back with the birders 10 days later, the surface ice had melted down, leaving the “yolk” standing in 3-D surrounded by icy ridges where the outline of the “egg white” once was. Wonder what created this interesting bulge in the ice? 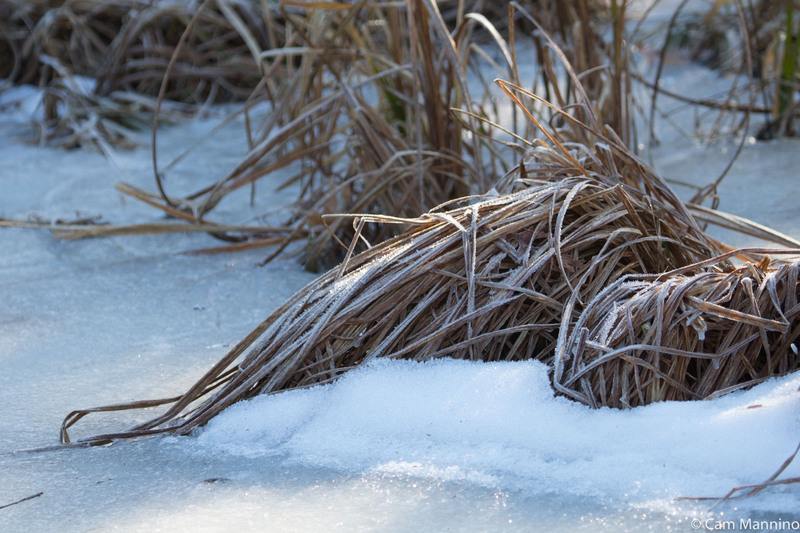 The “Sunny side up” ice Design in the reeds by the lake. Twice I came across ice fishermen out on the lake. 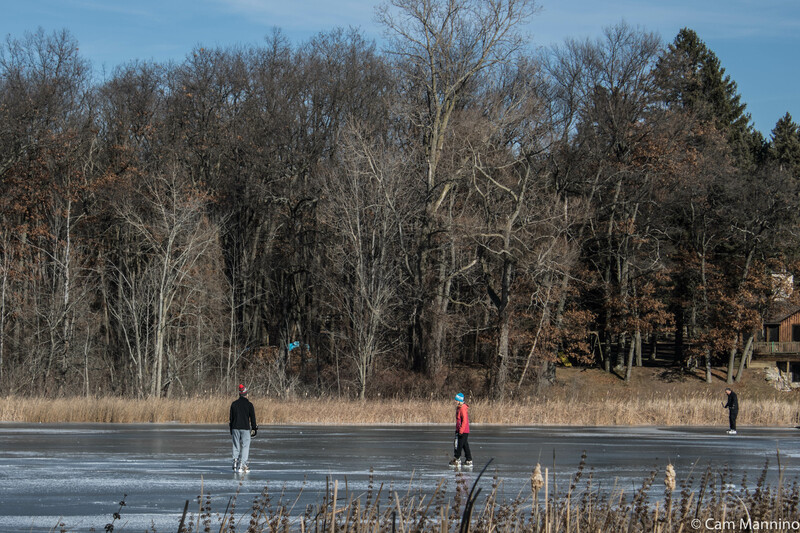 On the first visit, a man was unloading his sled full of equipment way off in the distance on the far side of the lake, while skaters glided about in the winter sunshine. Three days after these skating scenes, the melt had begun and the rains came. 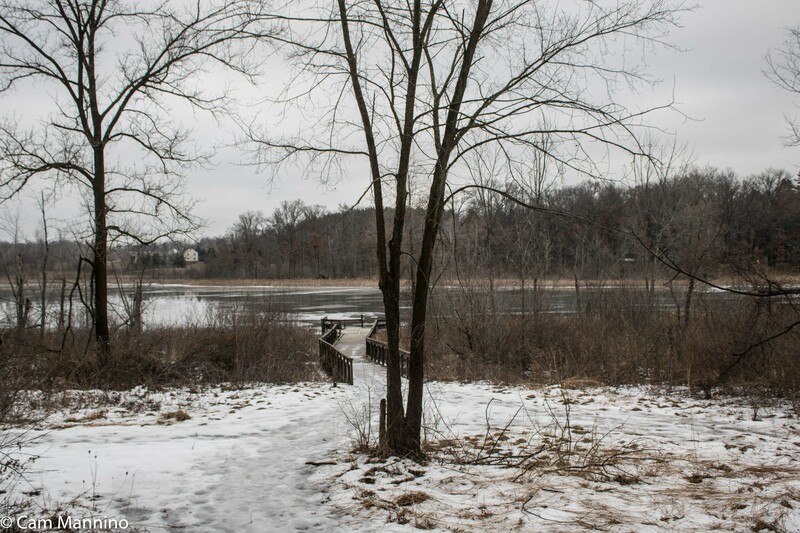 The surface of the lake turned from white to gray, with inches of water standing on ice. 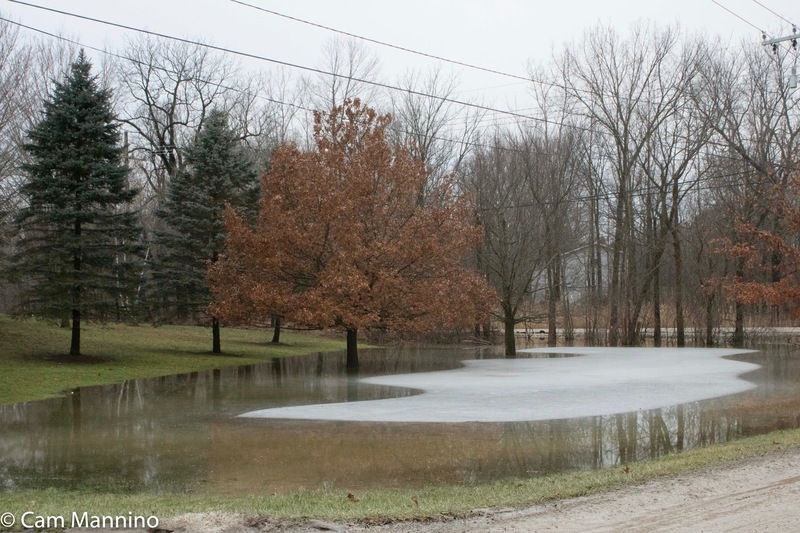 The lake after a thaw and rain but enough ice to support two ice fisherman (not pictured) sloshing along the surface. I saw (but didn’t photograph for some reason!) two fisherman walking out into that sloshing mess, confident about the ice underneath. A strange sight! It looked like two men walking on water! 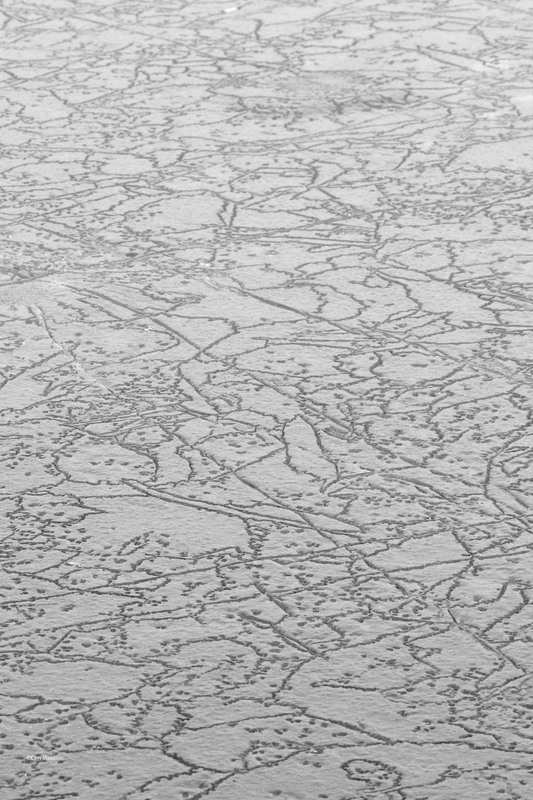 The last day I visited the park with the birders, the ice had developed a crackled surface. Quite a wonderful abstract design, but not one that would encourage venturing out onto the ice! 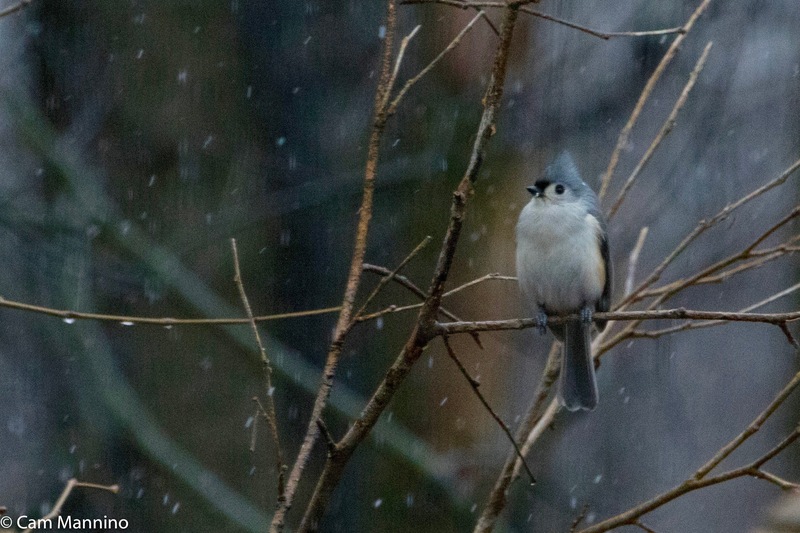 Later that week as the snow began to fall again, a Tufted Titmouse paused for a few moments in a nearby bush. 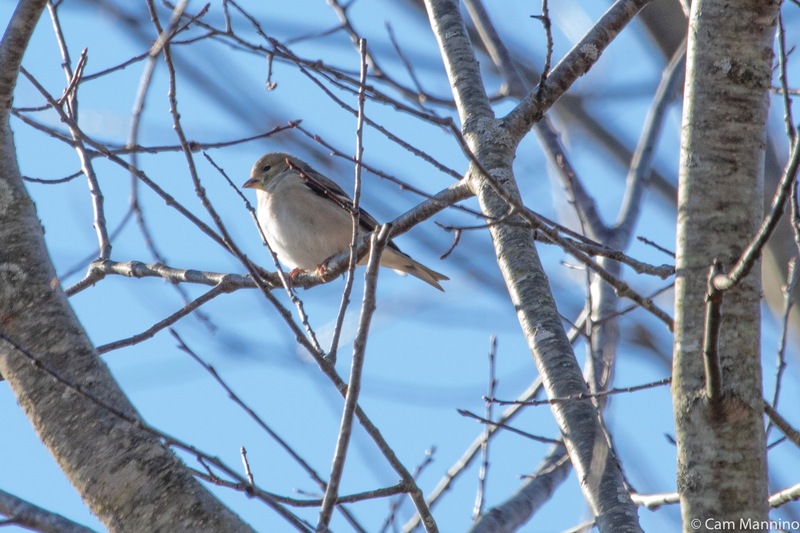 One of these little birds fooled the experienced birders in our Wednesday bird group by seeming to mimic the “cheer” call of a Carolina Wren. According to the Sibley Guides website, Titmice have a wide variety of songs so maybe this is one of them. Quite a performance, anyway. On my way home from Draper Twin Lake Park one morning, I stopped to admire a “modern art” ice shape in a pond at the corner of Buell and Lake George Roads. It could almost have been a composition by Matisse or maybe Paul Klee. For much of my life, I missed the details as I hiked through a landscape. The camera encouraged me to look more closely. 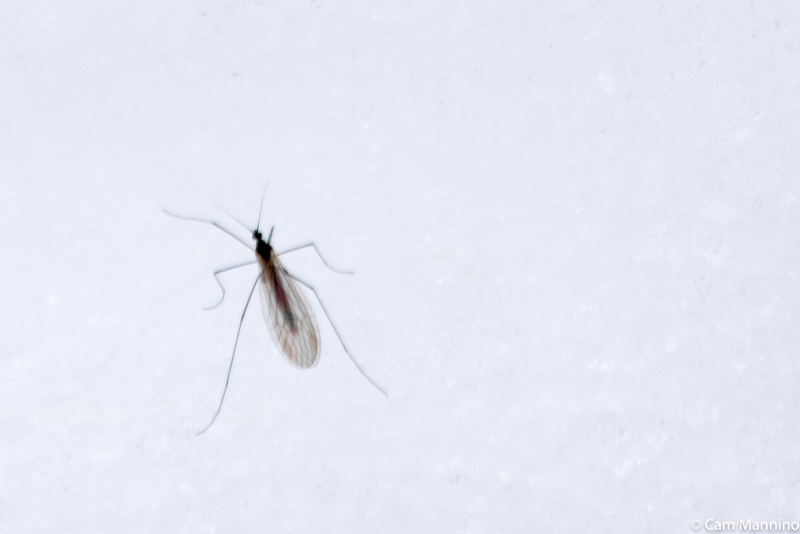 Now nature gifts me with surprises – the quizzical tilt of a dragonfly’s head, the spiral of seeds in a flower head and this winter, odd ice designs and strokes of color within winter’s gray and white world. But a camera isn’t necessary. An observant pair of curious eyes is all we really need to notice the beauty that might otherwise be missed, especially in a January thaw. Allaboutbirds.org, the website of the Cornell Ornithology Lab at Cornell University; Wikipedia; Herbarium of the University of Michigan at michiganflora.net; Birds of North America Online; Audubon.org; Nature in Winter by Donald Stokes; Trees in My Forest by Bernd Heinrich; Winter World by Bernd Heinrich, Savannah River Ecology Lab (Univ of Georgia).